Sooo, summer is back? 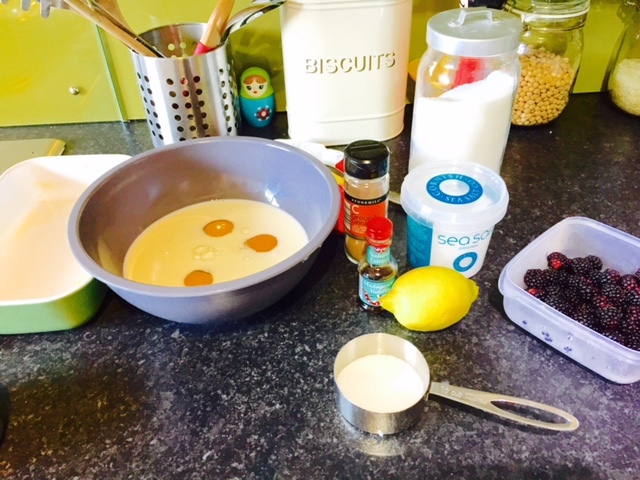 Today was sunny and bright, so I decided to go foraging for more blackberries for this recipe. My secret spot had some lovely dark berries ready to come home with me. There are also lots that will be ready in a few days, so I’ll be back again. Sometimes it is tempting to pick berries that are nearly ready, but the darker the berry, the sweeter the juice. If you pick them too early, they will be tart and maybe sour. First, preheat your oven to 350 C / 180 F. Thoroughly grease your baking dish with butter. I used a small ceramic casserole dish and it was large enough, but I may try to bake this in my ceramic pie dish next time. Next, combine the milk, eggs, and vanilla in a bowl. Either whisk this well, or use a hand mixer to get it nice and smooth. 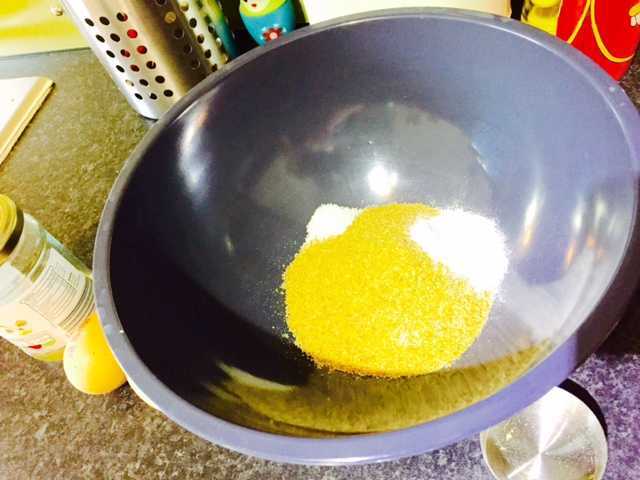 Then add HALF of the sugar and all the flour, salt, lemon zest, and cinnamon by whisking or using a high speed mixer. 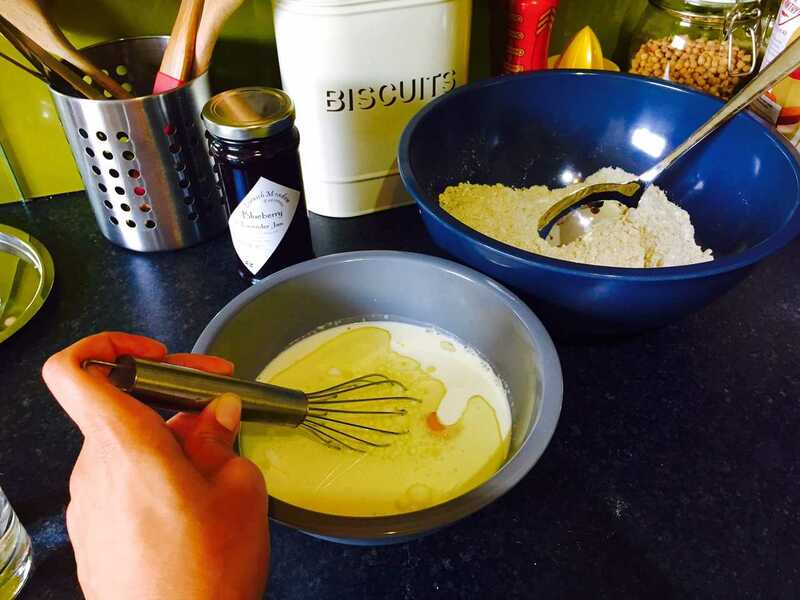 You really want to get this batter as smooth as possible for the best results. With your oven hot and ready to go, pour about 1/4 of the batter into the baking dish. Place this in the oven for about 5-10 minutes. You want it to begin to cook, but I’m still figuring out exactly how long this initial bake should be. Basically, you want a bit of a firm base to put the berries on. For me, 10 minutes was sufficient. There will still be liquid batter, but you should see the batter begin to fluff up the sides. Use your pot holders to take this out of the oven. 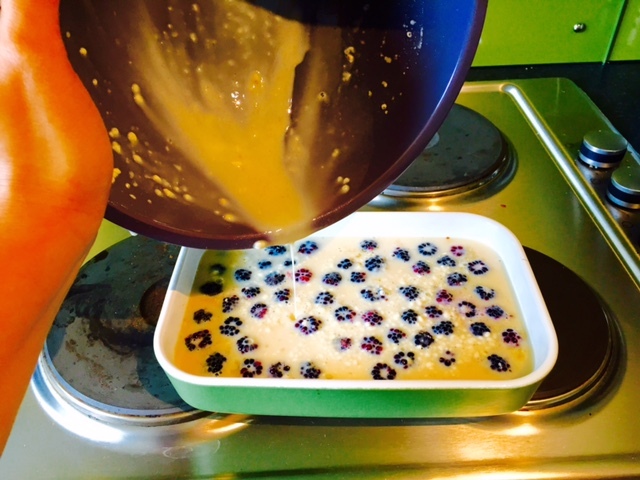 Then add the berries in a single layer amongst the batter and sprinkle the rest of the sugar over the berries. 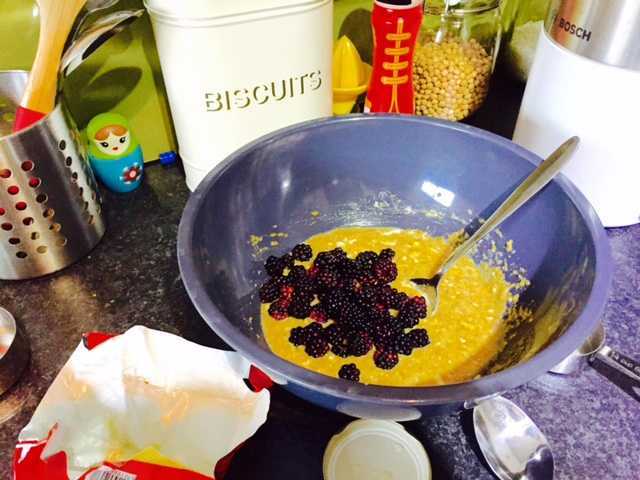 Next, cover the berries with the remaining batter. 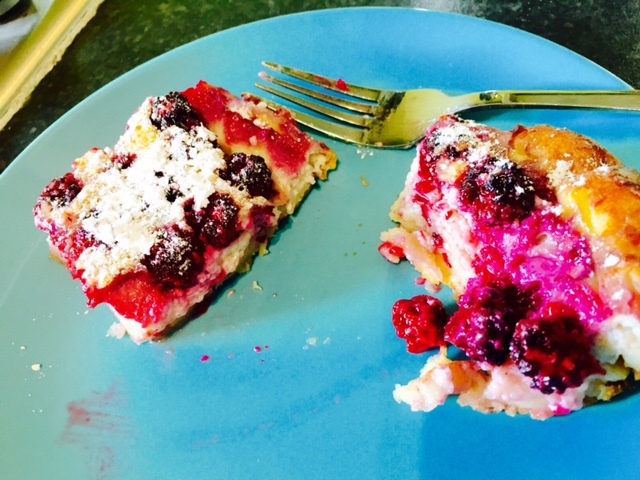 Keep in mind, the clafoutis will rise up and fluff out during the baking process. Place back into the oven for 45-60 minutes, depending on how your oven distributes heat. You’ll know when its ready if a knife comes out clean and it starts to brown. I baked mine for 45 minutes. I then turned off the heat, and left it in the warm oven for another 10 minutes. When you take it out of the oven, it should be very fluffy, a bit browned, and slightly wiggly. It will rise, but may sink a bit once it cools, or at least that’s what mine did. 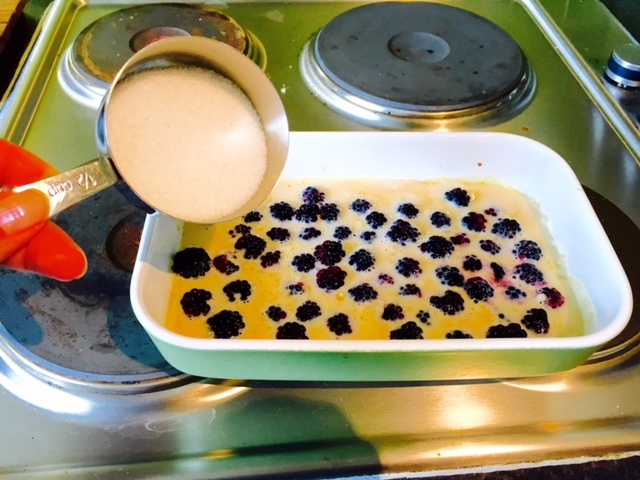 So that’s my wild blackberry clafoutis. Once served, I sprinkled a bit of powdered sugar on top. It was the perfect amount of sweetness and the vanilla really played on the ripeness of the blackberries. 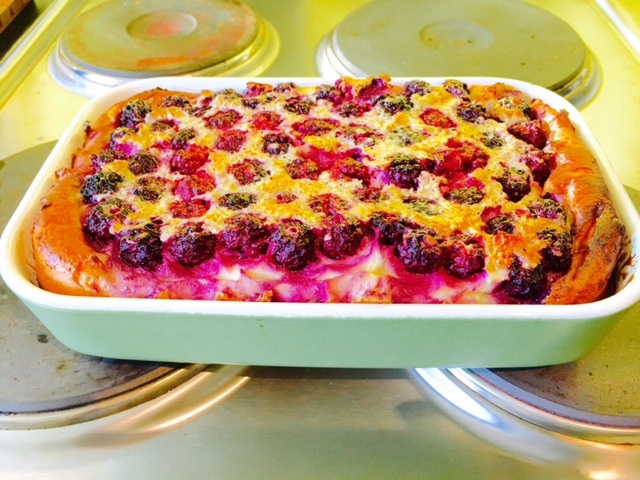 It is a great summer treat and you can use so many different fruit combinations in this. Peaches are starting to go on sale, so may try that next time, or perhaps some blueberries or apricots. The end result with whatever fruit you decide on, will be light and satisfying, and a great ending to a day of grilling. My favorite thing about this dessert is that I used all natural fruit I found growing wild, and the flavor just tastes of warmth and sunshine. I would love to plant some blackberry bushes of my own next year, but until then, I will continue to harvest what Bristol gives me. Toorah babber! Thanks for reading and Happy Eating! So, yeah. I’m not really sure where summer went, but there has been lots of rain, so I guess that means there will be a nice harvest come fall. 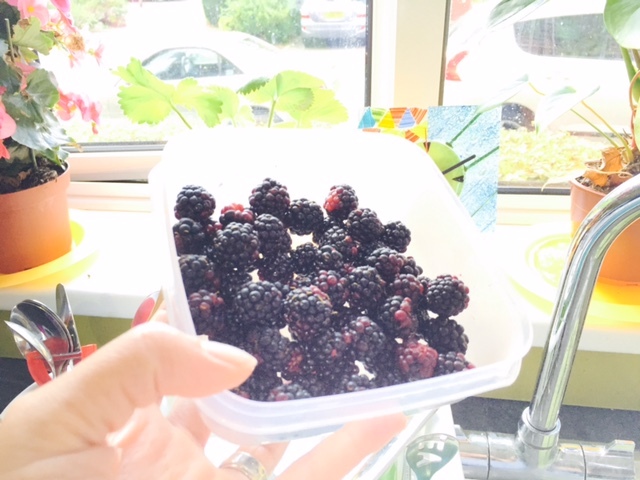 In between the rain showers, my better half and I have been doing some foraging for wild blackberries. 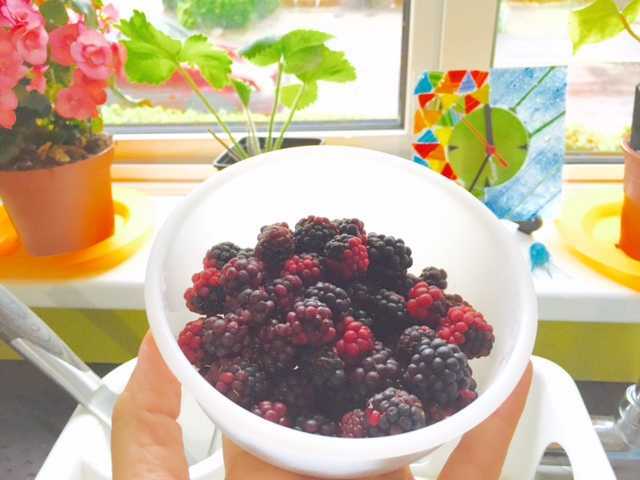 One might think that wild blackberries only grew in forested areas, or at least somewhere along country hedges. However, I’ve found several spots here in central Bristol (BS1!) with ripening plants. So this weekend, we were able to pick enough berries to make some healthy buns! 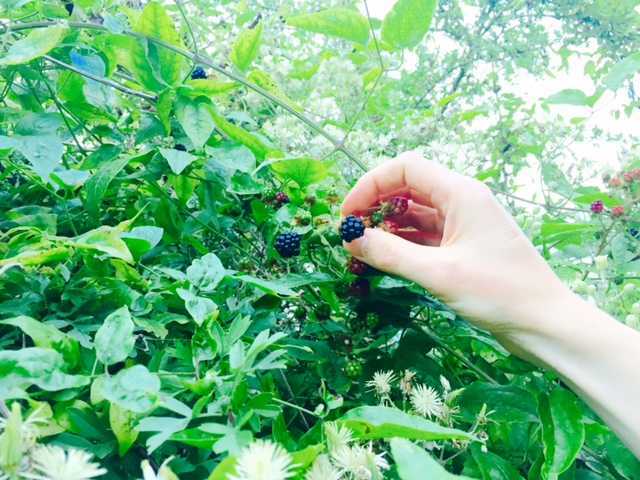 If you are foraging for the first time, make sure you do some homework first. Always be aware that you are picking the right kind of fruit, know what the leaves are supposed to look like, and if there is ever any doubt, take a picture and consult your local garden center. 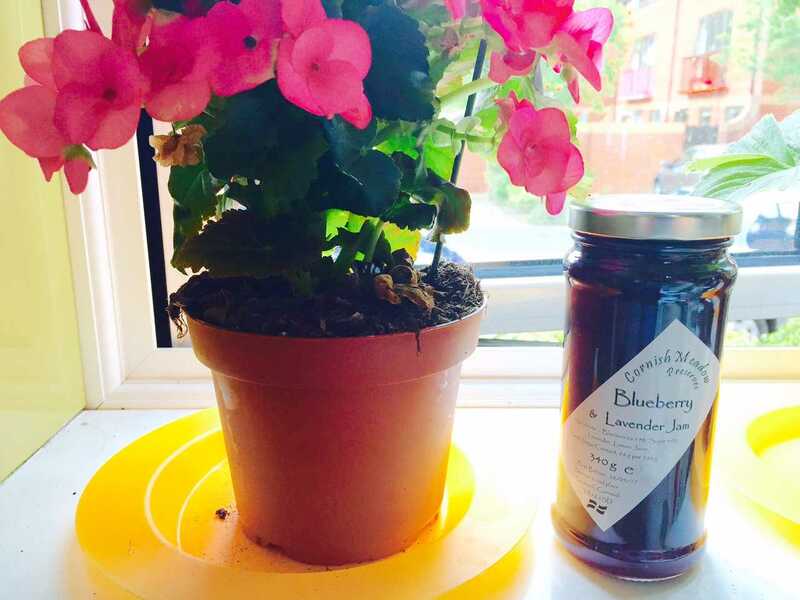 Blackberries tend to grow in clusters, have a specific leaf shape, and have thorny branches. What we found here in the city center, is that they are often growing within other hedgy type plants as well. 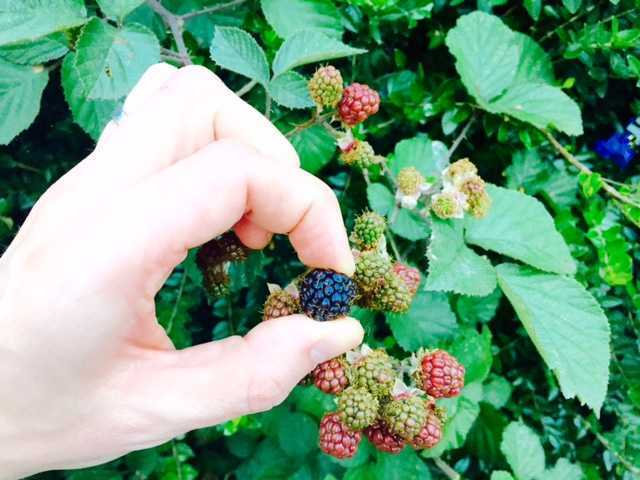 When picking blackberries, it is common to find the berries in different stages of ripeness, as seen above. You want to pick berries that are a very deep, dark purple. At this stage, they will be sweet and juicy. Any lighter purple or reddish, they will still be safe to eat, but can be very tart and sour. First grease your bun pans. I used coconut oil as it does great in high heat. 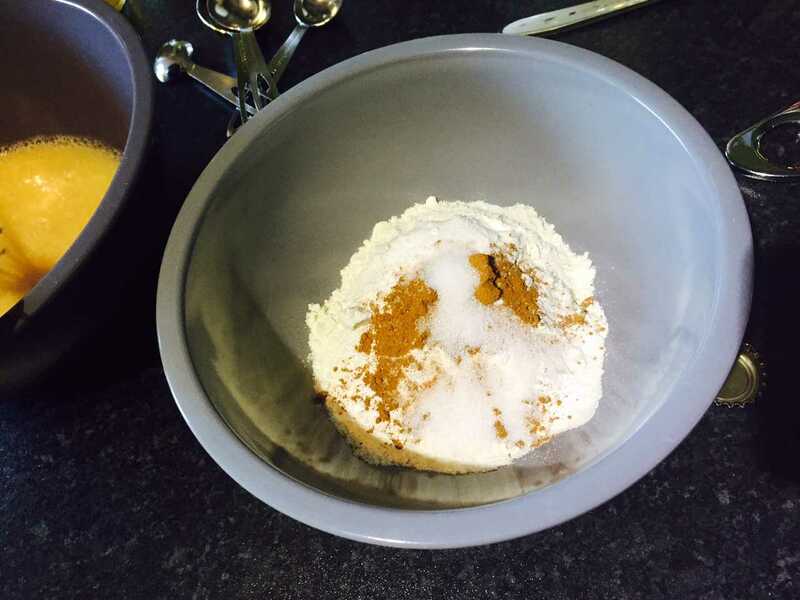 Then preheat your oven to 350 F / 175 C. Next, mix together the dry ingredients (linseed, baking powder & salt). Next, beat your eggs, and add the butter which should be nearly melted. Then add the honey and water, combining thoroughly. 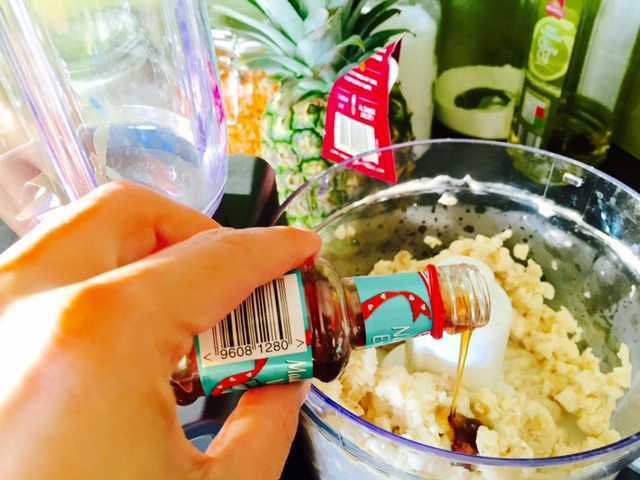 Once mixed, add the liquid mixture to your dry ingredients. Combine well, then add the blackberries. Next, add a large spoonful of the batter to each bun spot on your pan. In case you’re looking for these, here in the UK, you can find them in most home shops, and also at pound land. I have two pans; one from Robert Dyas and one from poundland and both work well just the same. In the states, I’ve seen them called muffin top pans. When ready, pop these in your oven for 17 minutes. You can adjust your cooking time if necessary. Just make sure you do the clean toothpick test before taking them out. You may find you need a few more minutes, so depending on your oven, a full 20 minutes may be better. 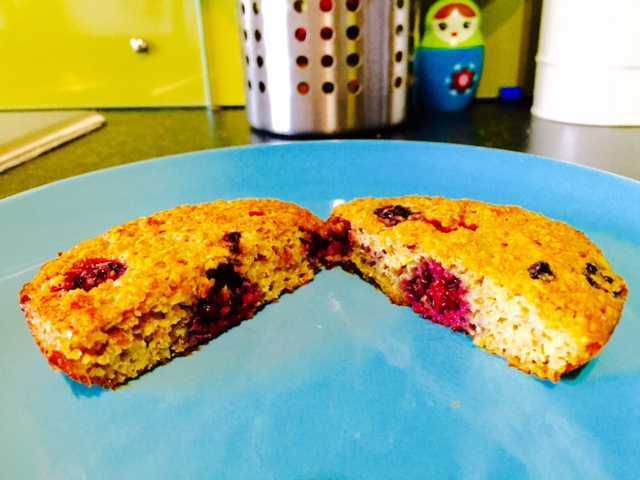 And there you have it – wild blackberry linseed buns! Let these cool a bit before taking them out of the pan as they will be very soft to handle otherwise. If your berries aren’t too sweet and depending on your taste, you may find you need to add more honey to sweeten. However, if you pick your berries at a very ripe stage, they will add a bit of natural sweetness. 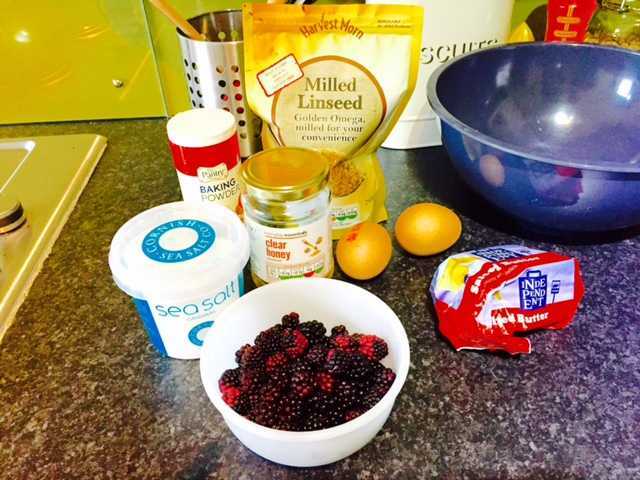 You can also add blueberries, sultanas, or dates if that is what you have on hand. Also, if you don’t have linseed, then ground flax seed will work in the same way. These buns turned out buttery and sweet, without being cloying. They were great as a tea snack and will be a perfect addition to tomorrow’s breakfast. Stay dry out there Bristol, thanks for reading, and Happy Eating! I love ice cream and nothing tastes as good as getting a whippy off the truck or a nice scoop in a shop. 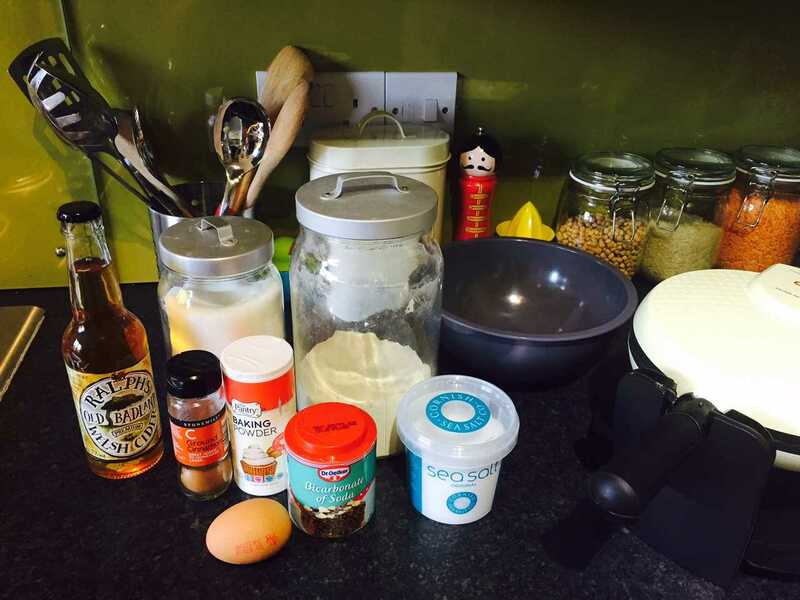 However, the other week, I tried to make home made ice cream. The flavor was good, but to be honest, I wasn’t too thrilled with the texture. So I decided to try something different and slightly more healthier. The picture above shows the result, which is a Strawberry Rhubarb jam Nice Cream. No, that wasn’t a typo; it does say Nice Cream. This treat is as smooth and silky as any soft serve ice cream, but with no dairy. How in the hell is this possible? One word: bananas. 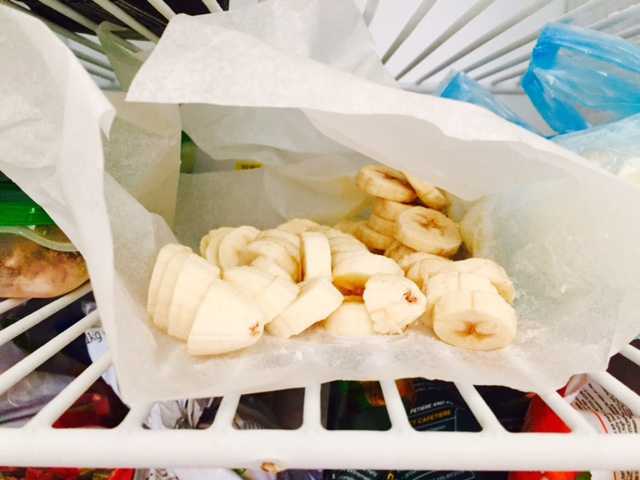 First, chop up the bananas into small slices or chunks, and freeze them on baking paper or wax paper. If you put them directly onto a ceramic plate, they will most likely stick to it and it will be annoying to try to get them off. 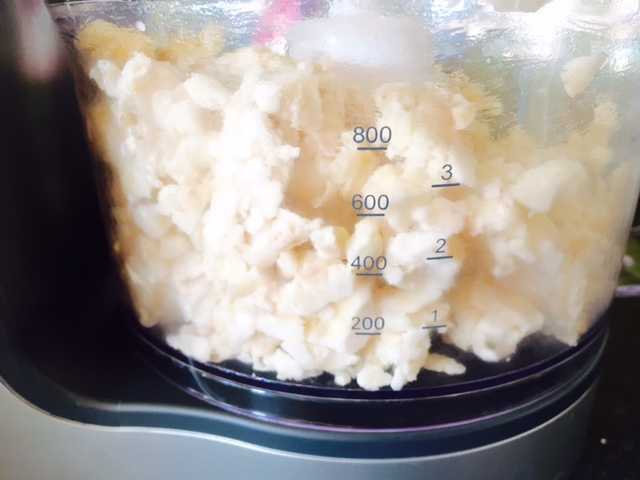 Once frozen (~2 hours depending on your freezer), transfer the bananas into a food processor. 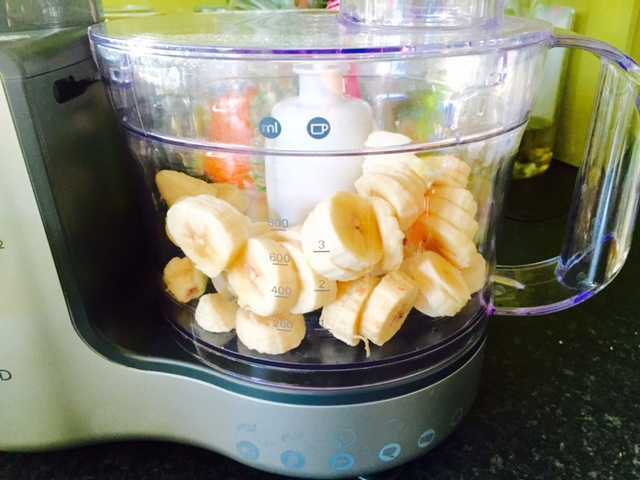 Pulse the bananas until you have something that resembles a course, chunky mix. My food processor isn’t the best, so it took a few pulses to get this consistency. At this point, you will add the almond milk and vanilla. Continue to pulse. If like me your food processor is just ok, the banana chunks may start to build up on one side. In this case, take spoon and push them back down towards the blade in between pulsing. The more you pulse, the smoother the mixture will become. Next you will add your jam. Any kind of jam will do. Here is where you can make it sweeter if you’d like by just adding more jam until it tastes right. If you have a good processor, you can allow it to blend a bit at this point. Continue to pulse or blend until it resembles soft serve ice cream. And there you have it, Jam Nice Cream! Cold, smooth, and sweet, but no fat and part of your 5 a day! Make sure your bananas are still yellow. Once they start to get brown spots, it can change the texture of the nice cream. Also, if the bananas aren’t fully frozen when you blend them, it can take on a slimy texture. There are a lot of variations you can make as well! One of my favorites is to pulse bananas, vanilla, almond milk and a heaping tablespoon of cocoa. Or instead of cocoa, toss in a handful of fresh berries for a naturally sweet nice cream. 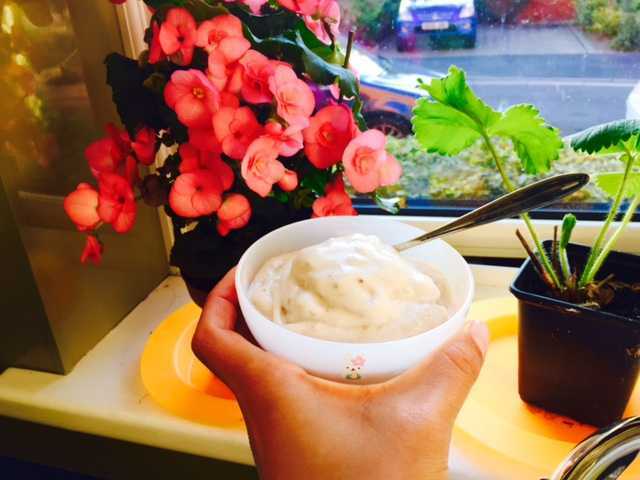 This is a simple recipe and on a hot day, can easily be eaten as part of your breakfast. 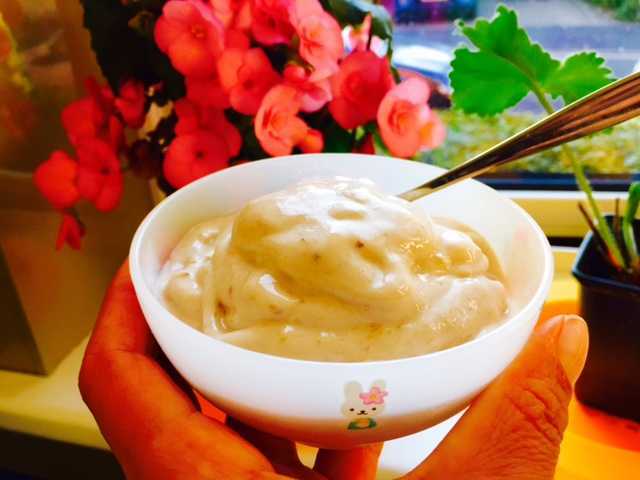 We often have it for dessert and I usually toss the chopped bananas in the freezer right before I begin cooking. That way, by the time dinner is prepared and eaten, they are just about frozen for a post dinner delight. If you’ve tried this type of recipe before, feel free to comment below with your favorite combinations. Thanks for reading and Happy Eating! Good day Bristol! After a great weekend on the harbor side, Monday gave us lots of rain to wash it all away. I really enjoyed seeing all the boats, people, and many food offerings. My favorite thing of the weekend was some garlic butter French prawns and the cardboard boat race. My least favorite thing was how the city center got a bit rough at night and felt a bit “stabby” at times. Anyhow, last night I was super hungry from all the activity and wanted to try one of the chili grinders I bought at the Three Counties Show the other month. 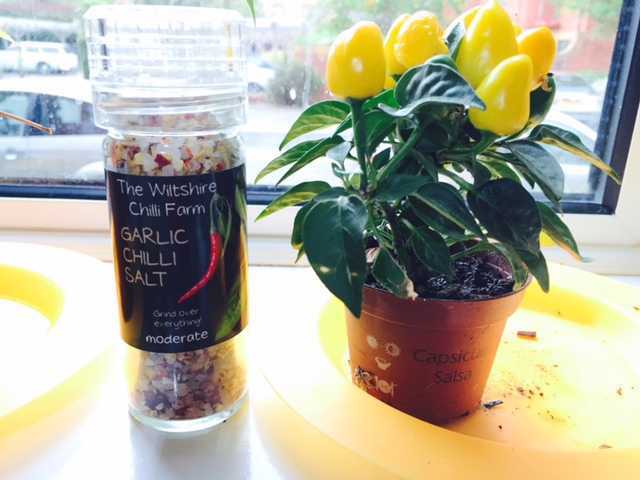 I decided to use the Garlic Chilli Salt made by The Wiltshire Chilli Farm. Having lived in the Southwest of the USA, I tend to have some sort of chilli or hot sauce most days with my meals. So I was surprised and excited when I saw I can have locally sourced spicy stuff. Their booth caught my eye as they had a huge variety of sauces, salts, and dried chilles on offer. The man I spoke to was very knowledgeable about the best methods for growing chilles in an English climate, which I didn’t realize was even possible. Their farm, just outside of Melksham in Wiltshire, uses poly-tunnels to grow their thousands of chilli plants and this method really seems to keep the plants in a favorable environment. They have only been producing their products for about 5 years, and already have received several awards. They were also present at the harbor festival this weekend and I look forward to ordering more online soon. They can be seen at lots of local events here, so if they are in your neighborhood, I highly recommend paying them a visit and sampling what they have on offer. Since I was using pork loin medallions (on sale at Aldi this week for 2.29), I really wanted to make sure they became tender and infused with flavor when I cook them. 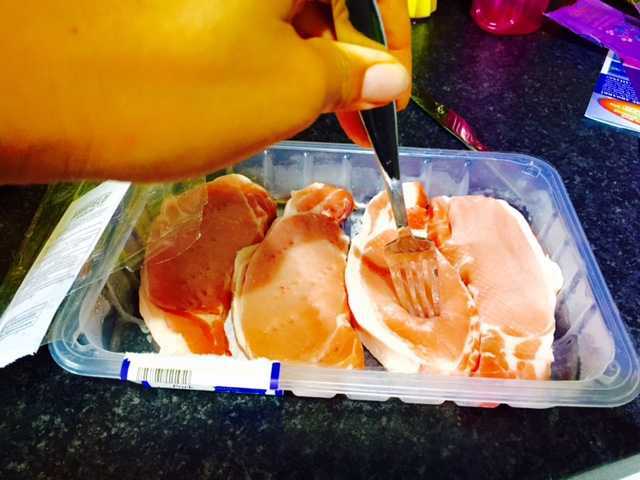 So what I always do when marinating meat, is to poke holes in the meat with a fork first. I also decided to marinate it in the plastic package it came in, making sure to remove the liquid absorbtion sheet on the bottom. It is recommended to marinate in a zip lock bag or glass container. I didn’t have either, but it turned out just fine. Next, I poured the soy sauce and peanut oilover the meat, making sure they were thoroughly coated. I then spread the coriander and garlic/ginger paste on each piece of meat before topping them with the chopped red onion. Next, I added two heaping teaspoons of seaweed gomasio. This is a spice mixture containing ground seaweed, sesame seeds, and seasalt. I used something similar when I lived in Japan, and found this brand at Wholefoods. However, I really only used it in this instance because it had sesame seeds. 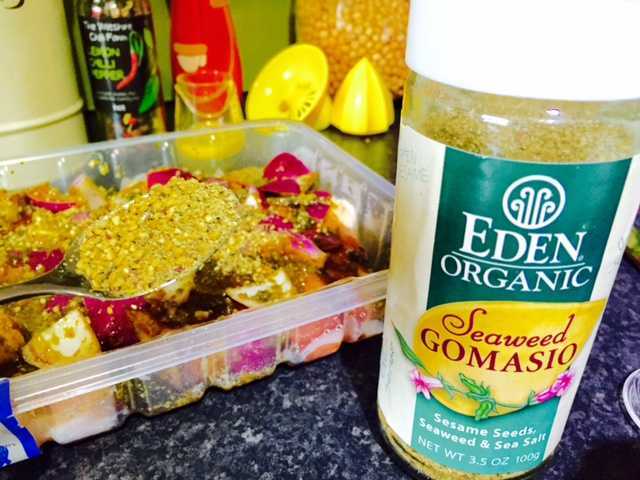 If you don’t have any gomasio, two teaspoons of sesame seeds will do just fine. Next I grinded out about one tablespoon of the Garlic Chilli Salt over the top. 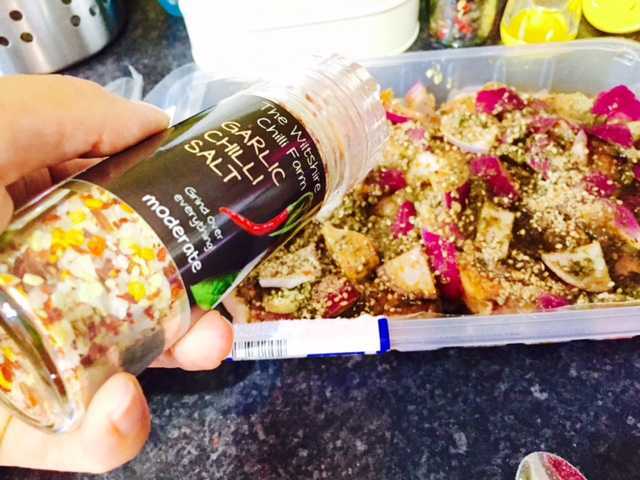 The smell was very fragrant and went perfectly with this marinade. I then covered the container and placed it in my fridge until it was time to cook, so about 7 hours. 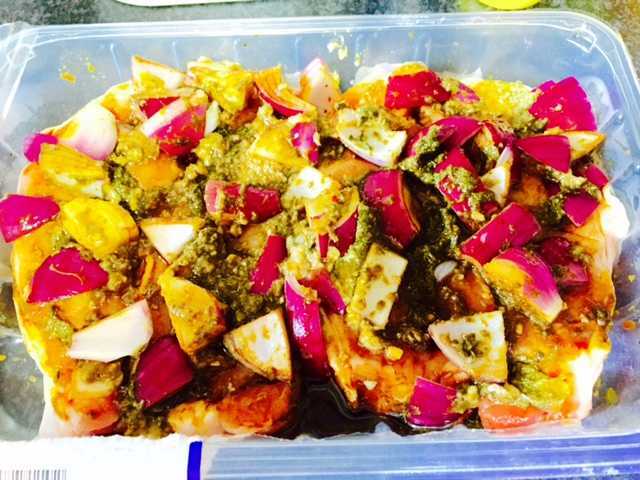 With marinades, there’s not necessarily a magic number of hours you need to let it sit. There have been times where I put together the sauce and cooked it right away, which still made for a nice taste. But as a general rule when marinating any kind of meat whether asian inspired or south west BBQ, the longer you let it sit, the better the meat will taste. 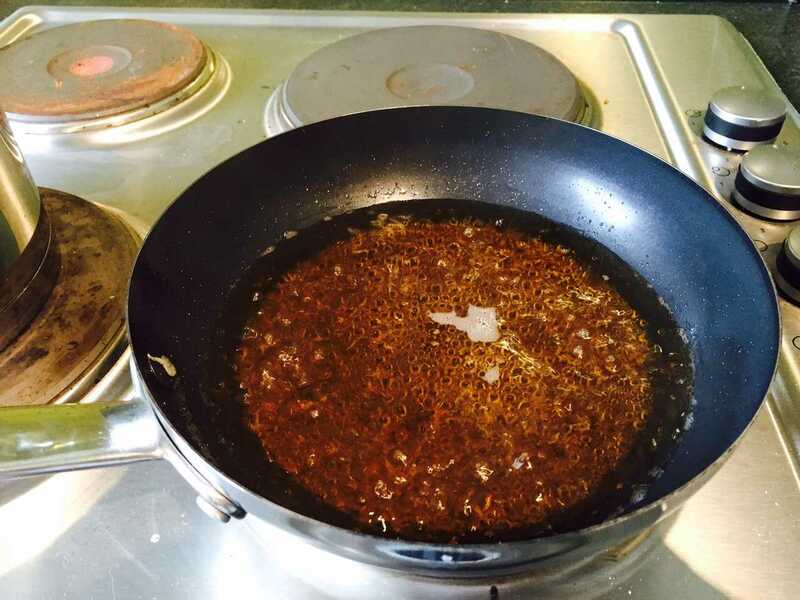 When I was ready to cook the meat, I put another table spoon of peanut oil and coconut oil into a large pan. 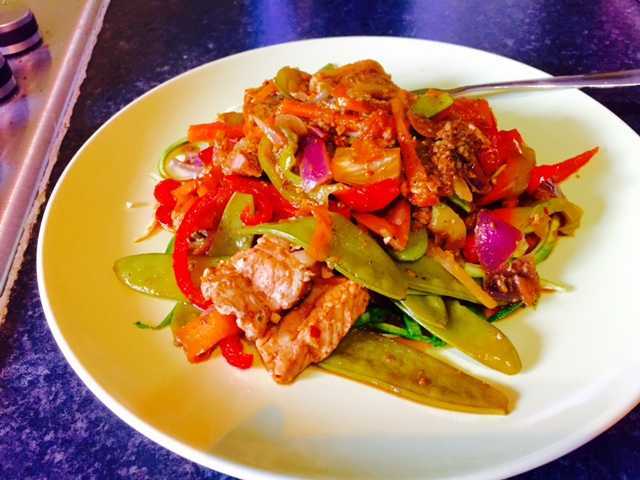 I then added the marinated meat, cut into strips (although you don’t necessarily have to cut it up) with a large red bell pepper, two grated carrots, and a handful of snow peas. I have a ceramic hob, so put the heat on three and let it slowly cook with a lid for about 30 minutes. When it was done, I poured the stirfry over a bed of spiralized zucchini and enjoyed every last morsel. The chilli salt gave it such a sharp flavor without being too hot. I wouldn’t say it was mild though, as every few bites had a kick when you got a bit of the chilli. Looking on the package, it uses dried “Ring of Fire” chillis in this spice blend. I can’t wait to use this again with a seafood dish, maybe shrimp actually. Well, that’s all for now. I’m thinking of what to make next and am thinking of using some sort of berries. This week is definitely about cutting down on the sugar and carbs a bit after all the awesome things I ate over the weekend. Hope you enjoy your week despite the rain and wind. Thanks for reading, and Happy Eating! 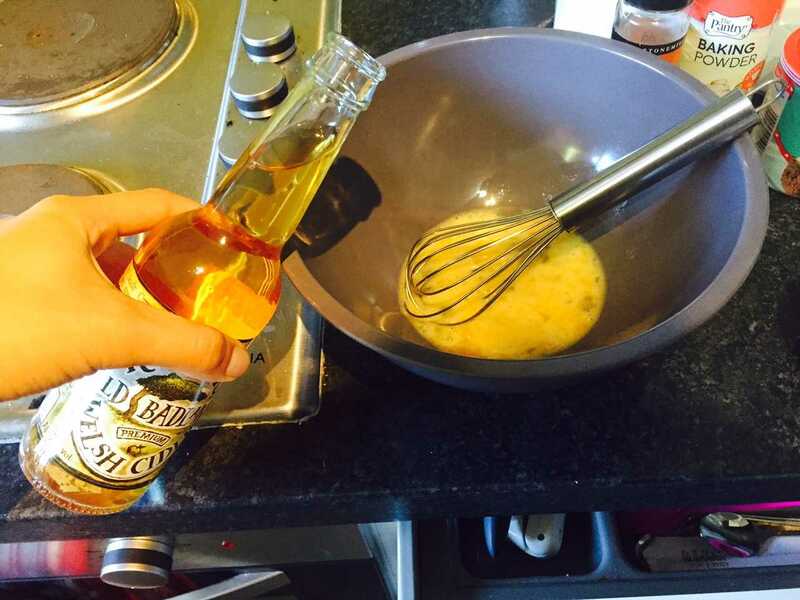 First in a large bowl, beat the egg then whisk in the cider until mixed. In a separate bowl, combine the rest of the ingredients. 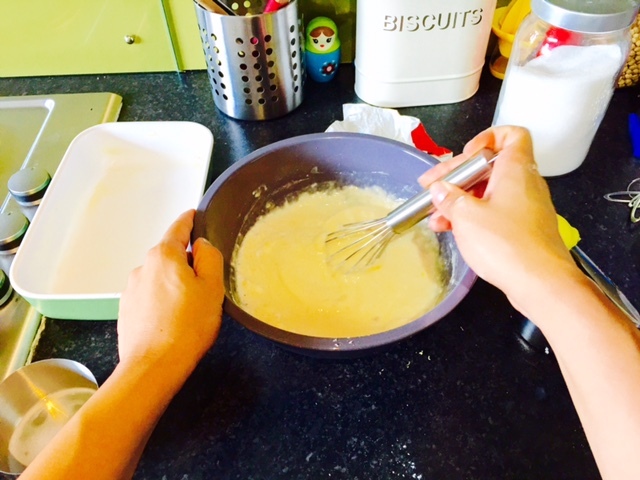 Add the dry mixture to the large bowl and whisk until thoroughly mixed. Make sure you follow the directions of your waffle iron as each might be a bit different. For mine, we added a bit of oil once heated. 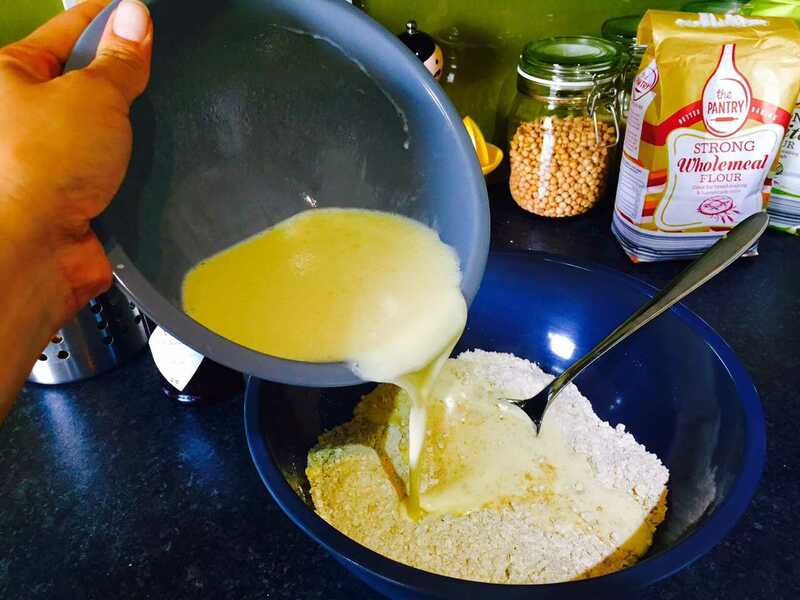 Add the proper amount of batter, close, and wait a minute or two until ready. 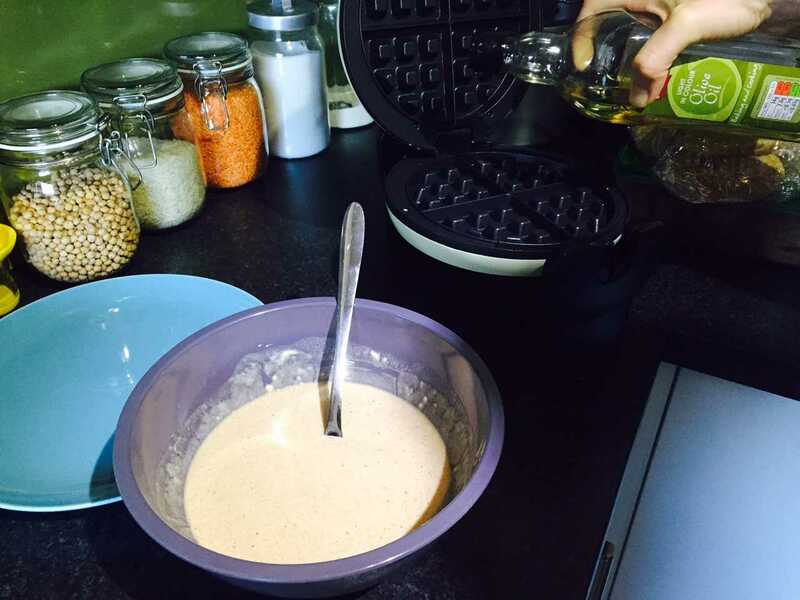 And there you go, Apple cider waffles! I topped mine with some strawberry rhubarb jam from Cornish Meadows Preserves. This is the perfect summer breakfast treat. 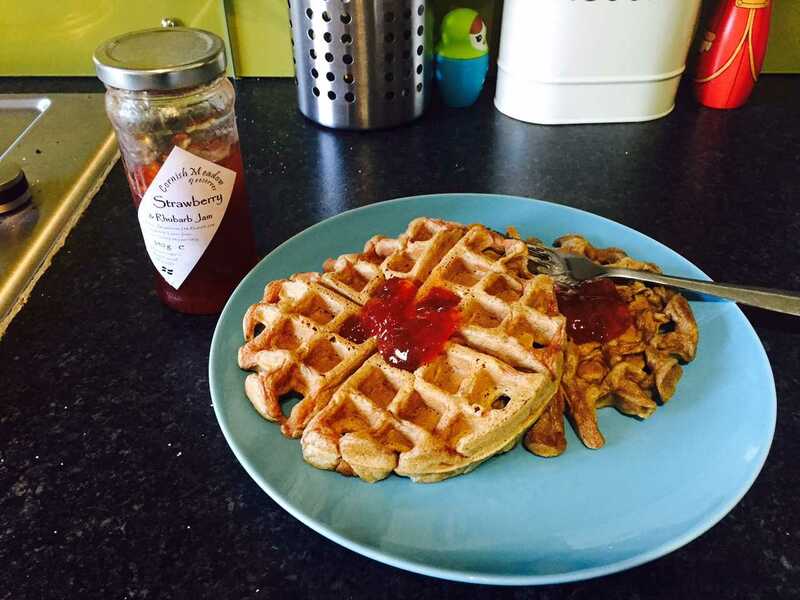 The waffles were fluffy and the jam accented the apple flavor perfectly. This will definitely get me through the day and what a gorgeous day it’s going to be – 70 degrees, sun, and hanging on the harbor side, what more can a girl want? Have a great weekend Bristol! Thanks for reading and Happy Eating! Good day to all! Here in Bristol! It is still overcast, but here’s hoping for sunny weather this weekend for the Bristol Harbor Festival. I took the ferry into town yesterday and it was fun seeing people hanging bunting and cleaning their boats, getting them in “Ship Shape and Bristol Fashion” for this weekend. 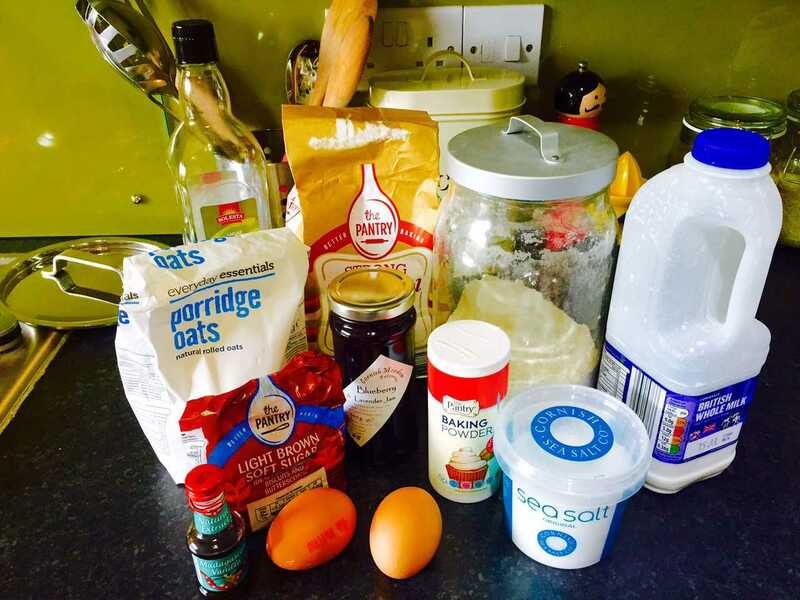 Today, I find myself with not so many errands to do, which means time for more baking. When I was a kid, we used to have a Berry Crocker Kid’s cookbook and this is what I used for a lot of my first baking trials. 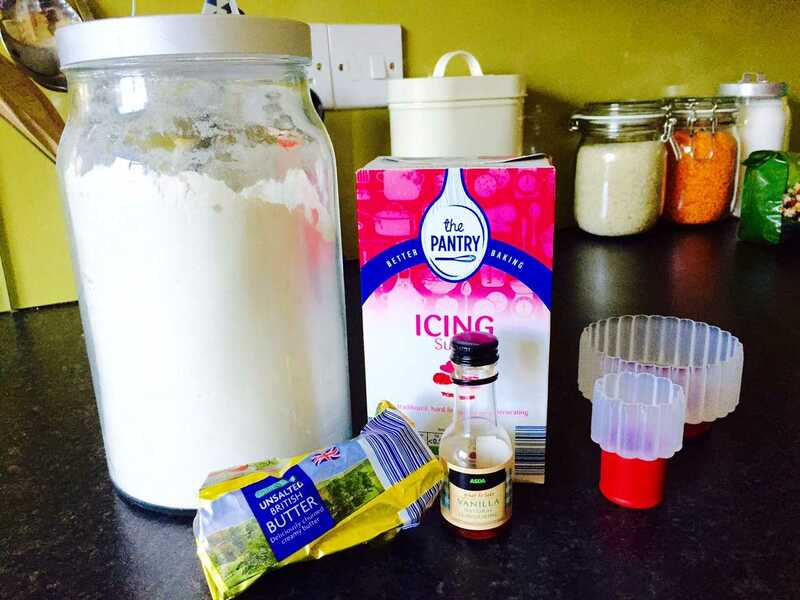 Infact, I specifically remember making jam filled muffins because it was easy and we usually already had all the ingredients at hand. So today, I will continue with a childhood favorite and will be filling the muffins with some Blueberry Lavender Jam made by Cornish Meadows that I picked up in Cornwall last month. This jam is very fragrant and the combination of blueberry and lavender just feels like summer so I think it will work really well with this muffin recipe. 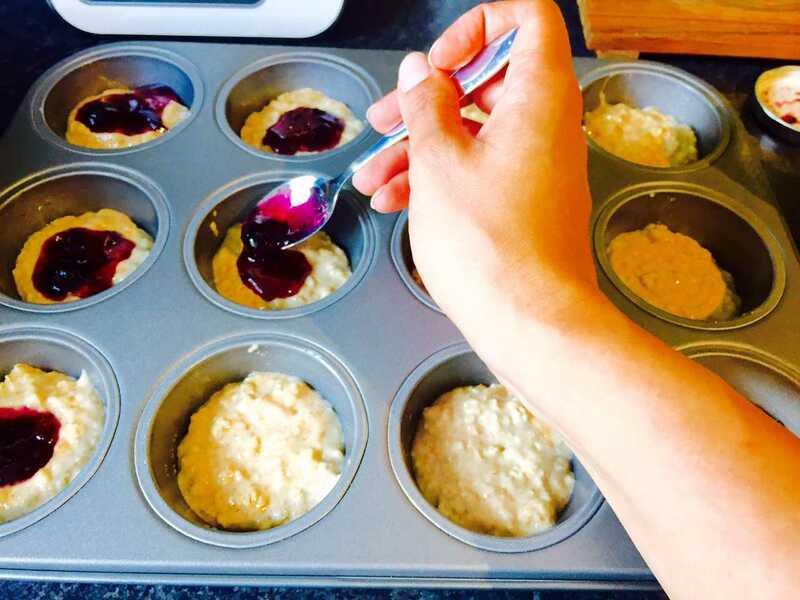 You will begin by greasing or lining a 12 cup muffin tin. 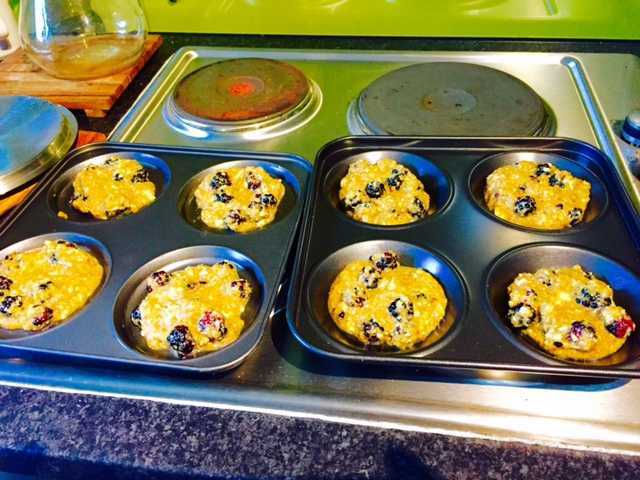 I used coconut oil to grease mine as I didn’t have any muffin liners. Then heat your oven to 400 F / 205 C. Next, mix in the first 6 ingredients, that is, all the dry stuff. 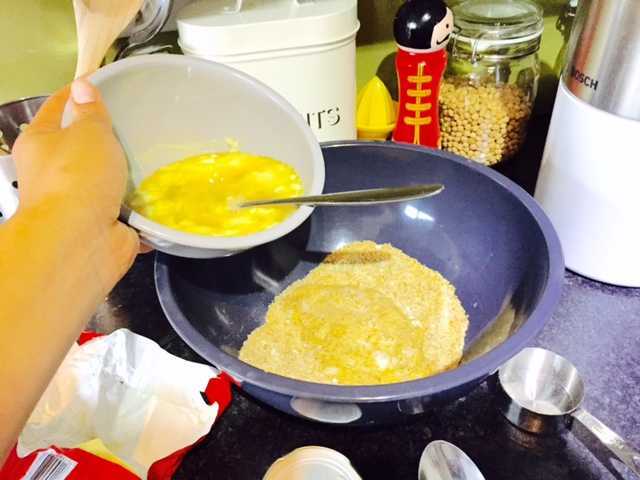 After combining the flours, sugar, baking powder, and salt, set aside and combine the wet ingredients (eggs, milk, oil, vanilla) in a smaller bowl and whisk until combined. Next, stir the liquid mixture into the dry mixture and combine thoroughly. 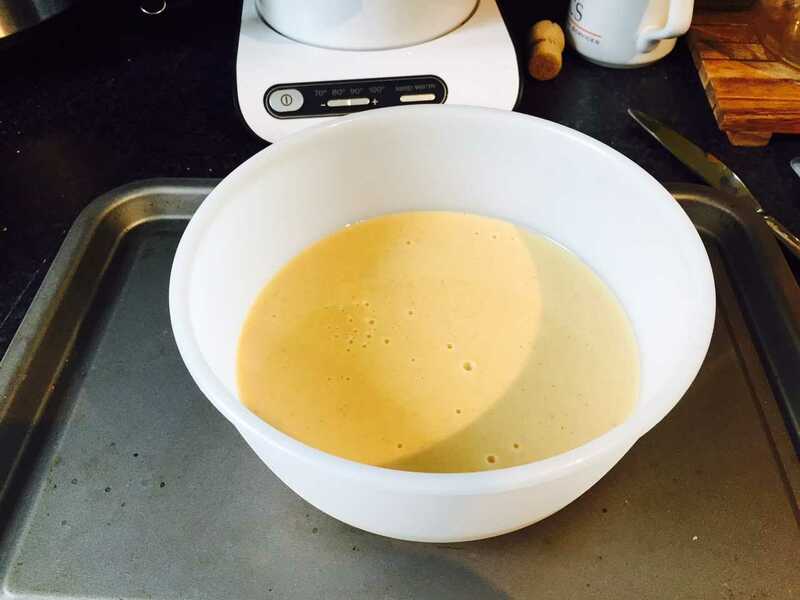 This will be a thick batter, not a runny one. You want it thick because it will be a base for the jam middle. 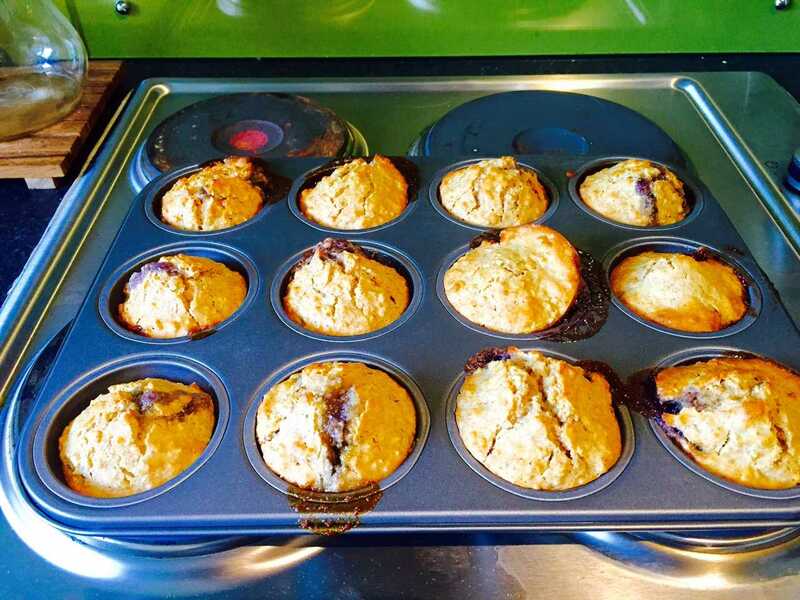 Once combined, fill each muffin cup only about 1/3 full. I made the mistake of filling to nearly 1/2, but remember, these lovelies WILL rise. 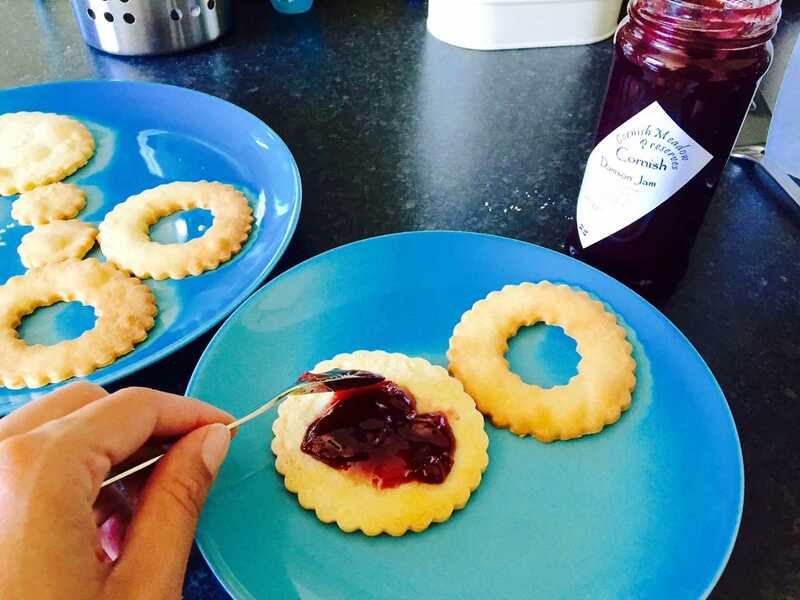 Then take a small spoon, and place a small dollop of jam into the middle of each battered cup. 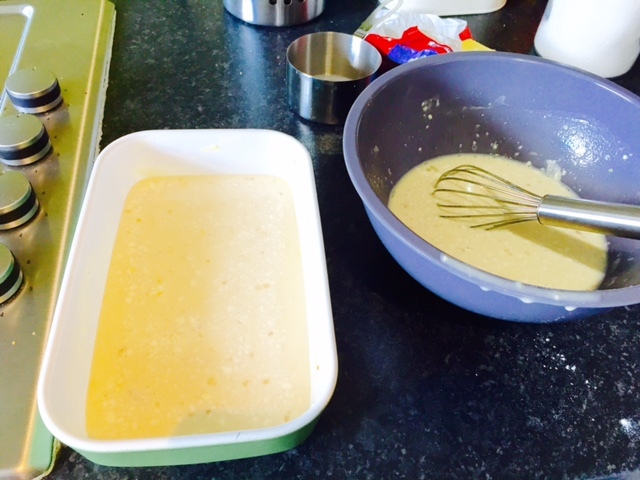 Then cover each with the remaining batter, trying to cover the jam as much as possible. 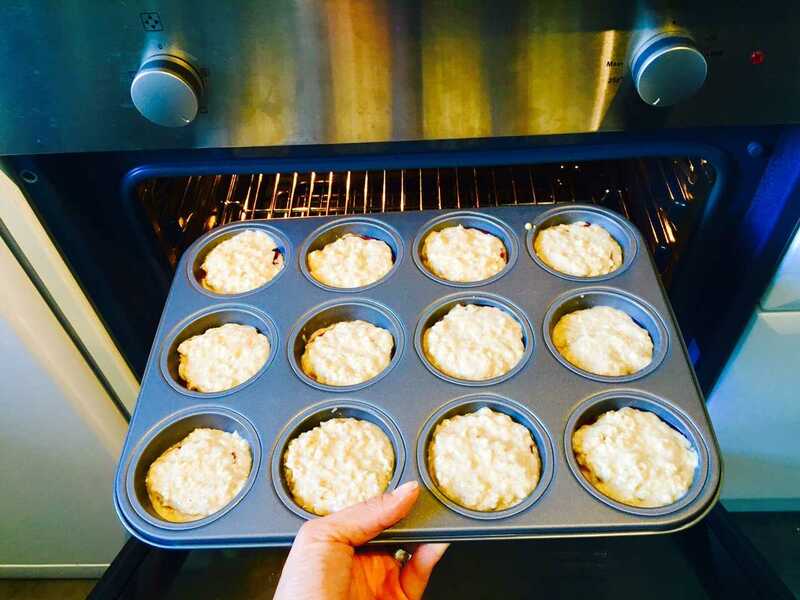 You will then place the muffin tray into the oven for 15 minutes, or until a toothpick comes out clean from the side of the muffin. If you stick a toothpick in the center, it will come out covered in jam, because, well, they are jam filled muffins. If like me, you put too much batter in each cup initially, you’ll have some jam oozing out as the muffins rise. Don’t worry too much about that because they will still taste awesome whether they are pretty or not; your taste buds will thank you just the same. 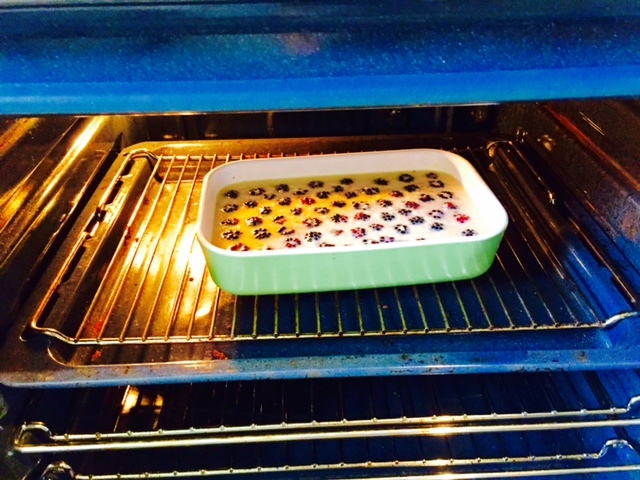 Just make sure you have a baking sheet or foil on the bottom of your oven to catch any jam drippage. 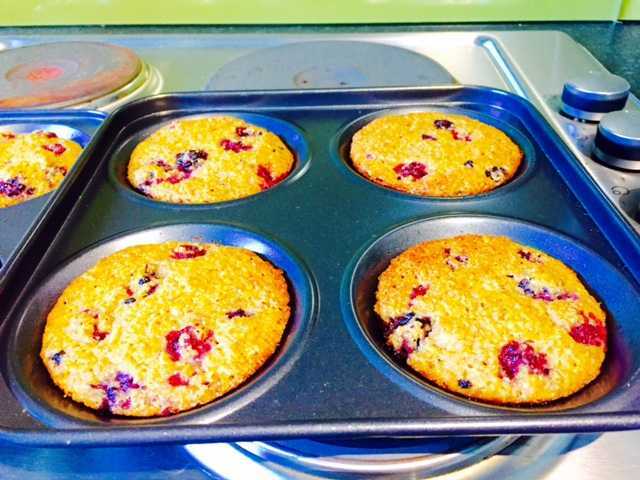 When you take them out of the oven, let them cool before you try to remove them from an unlined muffin tray. Also keep in mind, the muffins are hot, so the jam inside will be hot as well. 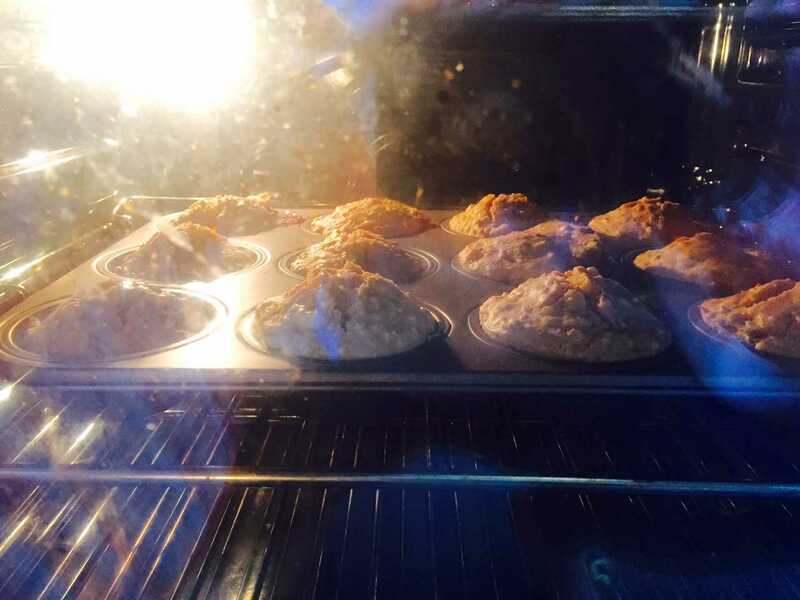 If you’re lucky, you’ll produce a fine bit of muffin like the one below that I managed to prepare correctly. The muffin will be a bit dense, but moist with a nice dollop of jam inside. 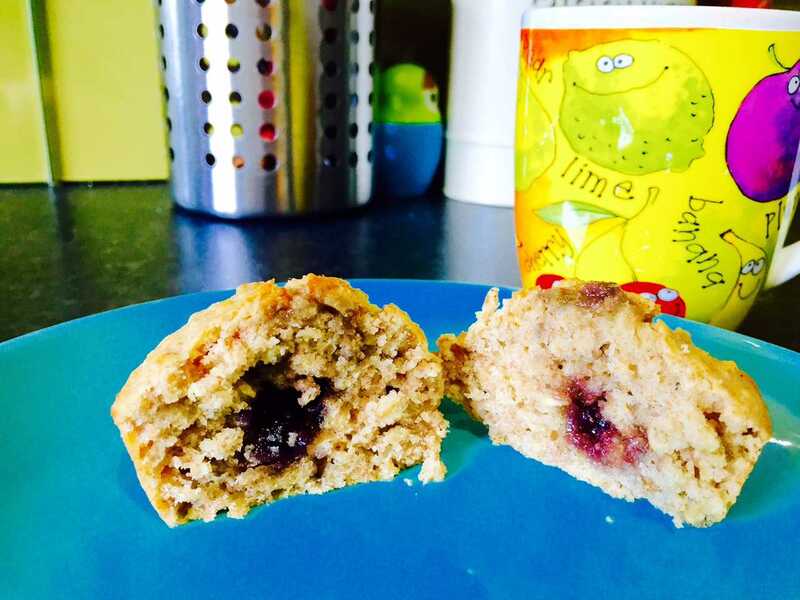 Most of my muffins had oozing jam, but hey ho, I still have muffins. 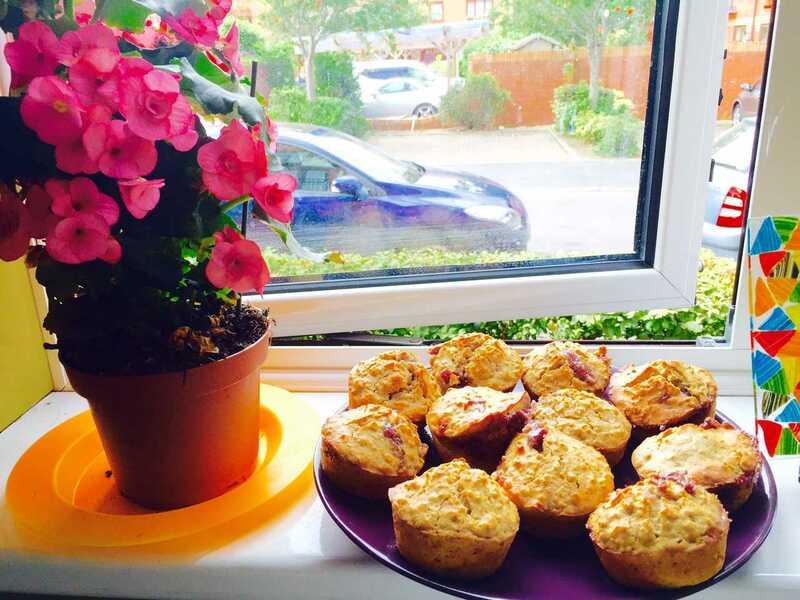 .I really enjoyed making these muffins as they reminded me of my childhood baking days. As an adult, I am thankful my mom trusted me so much in the kitchen and gave me the freedom to bake, make mistakes, and learn from them, without hovering over me. It gave me a certain kind of confidence that meant it was ok if something didn’t turn out right and the encouragement to start over to produce something great. Enjoy your weekend where ever you are, and if you’re in Bristol, come down to the harborside! Thanks for reading and Happy Eating! 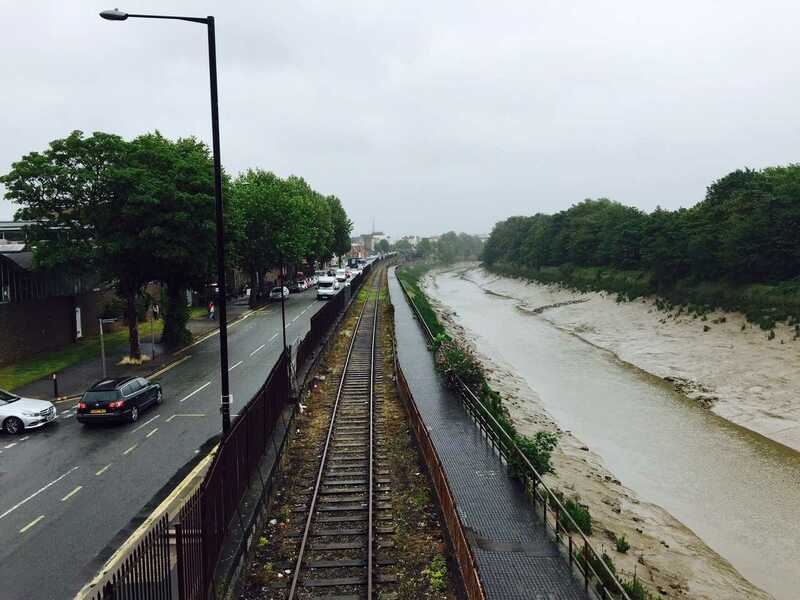 Ahh, a typical English summer day. Overcast, rainy, not too hot… more like a California winter for this west coast girl! Well, when life gives you lemons, you make lemonade. But I live in Bristol and here, life tends to give you cider sometimes. 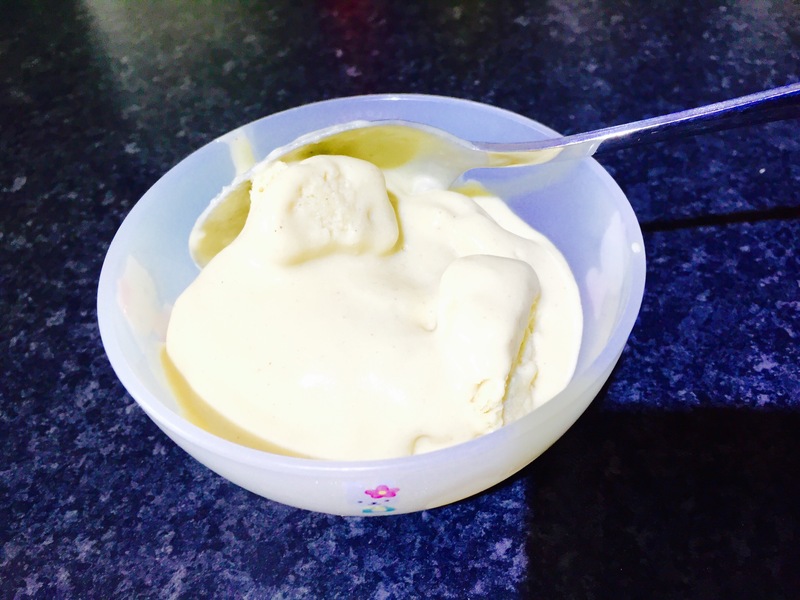 So, I decided to make apple cider ice cream. I mean, it is still summer after all. I don’t have an ice cream maker, but I decided to try this anyway and will post the results however it turns out. First, you’ll want to add one cup of the cider and 1/4 cup of sugar to a saucepan and bring to a boil until it is reduced to approximately 1/3 of a cup. 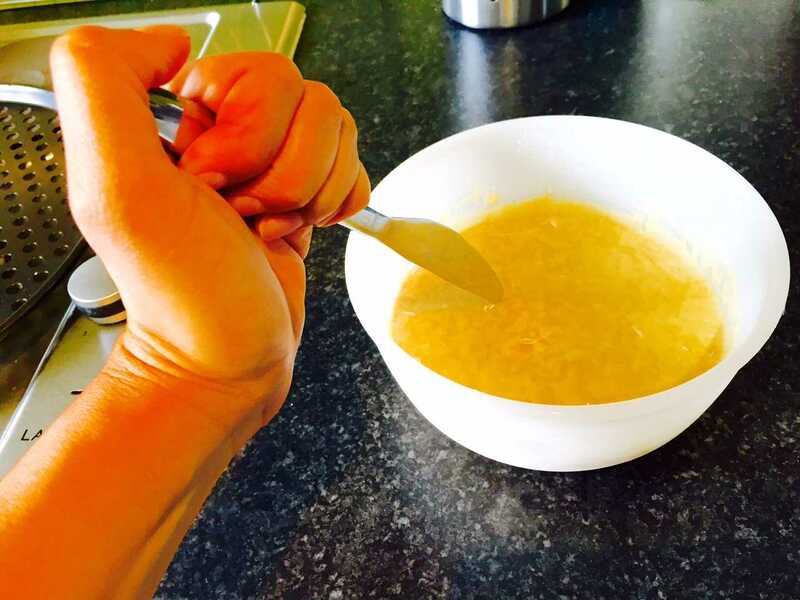 Make sure you keep an eye on the bubbling mixture, stirring it throughout to prevent any burning. Once reduced, take off the heat source and add it into a saucepan with 1 cup of milk, 1 cup of double cream, and 1/4 teaspoon cinnamon, whisking the entire time. In the future, I will use the same sauce pan instead of transferring the cider mixture as it will need to start warming up. In this case, I switched the hob on mark 1 as you will need to add some of this in the next step. 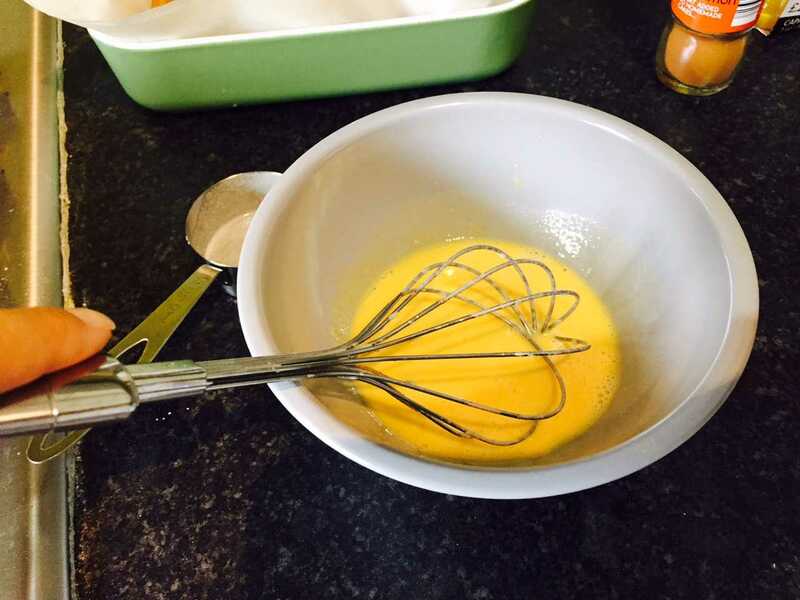 In a separate small bowl, add the three egg yolks and whisk. 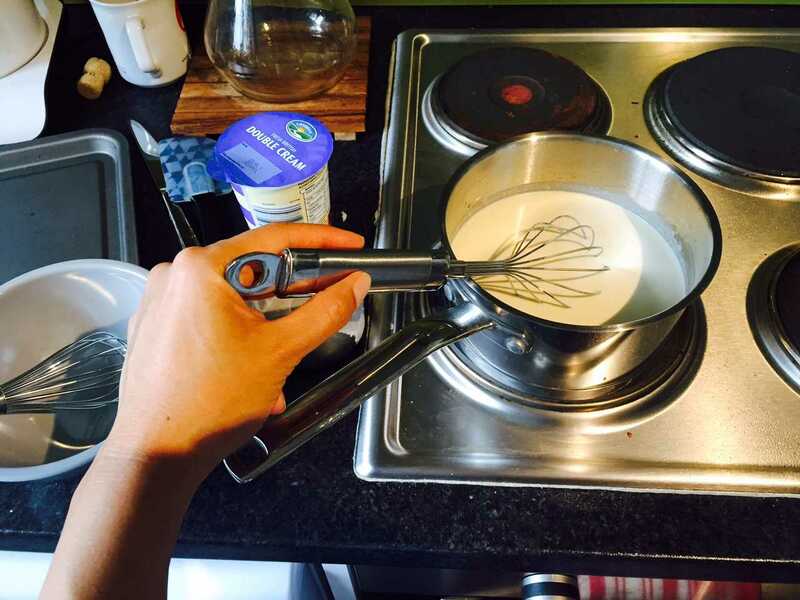 You are basically creating an almost custard base, so make sure none of the egg whites are attached. 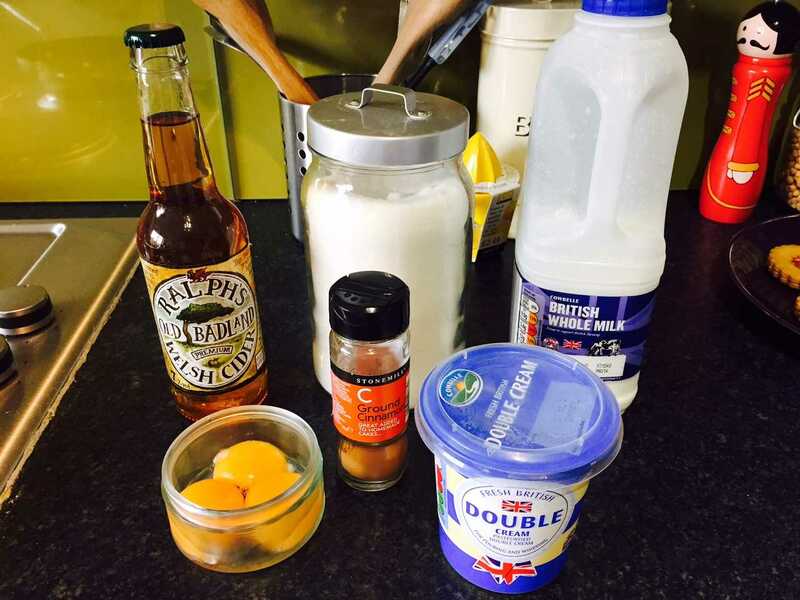 Once the eggs yolks are whisked to a smooth consistency, you’ll want to temper them by adding some of the warm cider/dairy mixture. I added 1/3 of a cup to mix with the yolks. 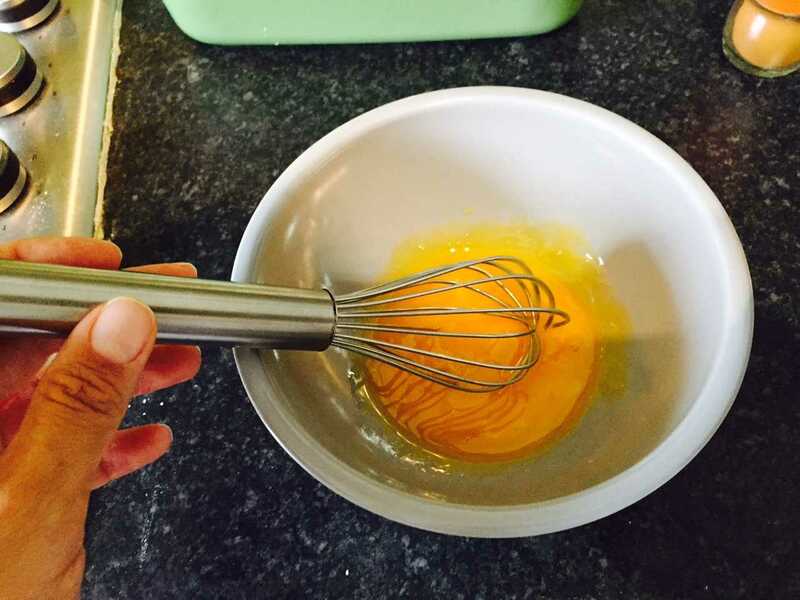 Once tempered, add the yolk mixture to the saucepan, bring to a boil and whisk away. You want to cook this until thick; you’ll know its enough when it coats the back of a spoon. Since this is the first time I’m making ice cream, I thought it was thick enough, but now looking at the picture, I think I should have given it a few more minutes. Once mixed and thick, transfer to a heat proof dish to let it cool to room temperature. You can do this by placing it partially in an ice bath. Since I didn’t have any ice or ice trays, I put it by the window since it was pretty much the antithesis of a summer day. This is also the container I will be freezing it in since I do not have an ice cream machine. 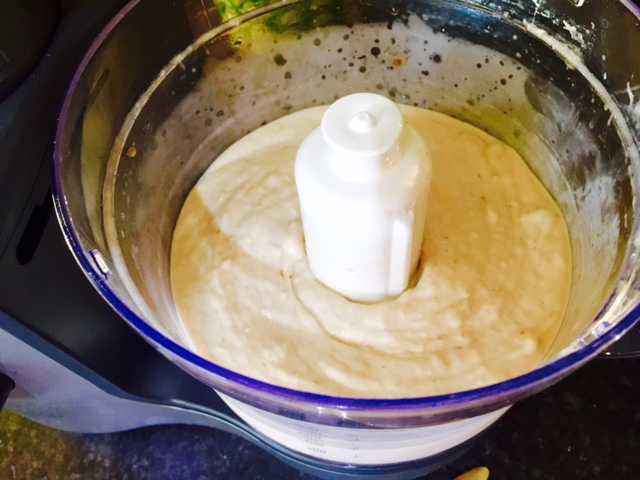 After it cools, you can transfer the mixture to a machine if you have one and let it churn away. If not, just place a lid over it. 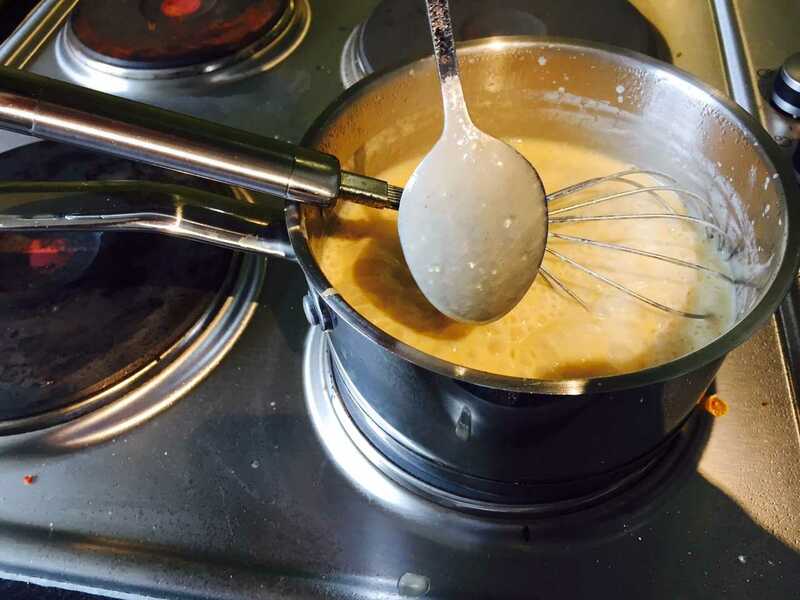 If like me you are trying it freestyle, it is recommended that you use a whisk to stir the mixture every 45 minutes until frozen or nearly there. To be honest, this process took too long for me to be that vigilant. I stirred it once, then realized it was 9 pm and started to get ready for bed. This morning, I checked on it and it sure was frozen. Like a brick. So it will need to thaw out some before I scoop it out for tonight’s dessert. So, the verdict on this recipe is still out. I don’t think I will try this again as it really did take much longer than I thought. And in the end, didn’t produce more than about 2 cups of ice cream which I can easily polish off myself if I didn’t love my husband so much. I will update this post tonight after I taste it, but for now, I can’t even scoop out a bit. 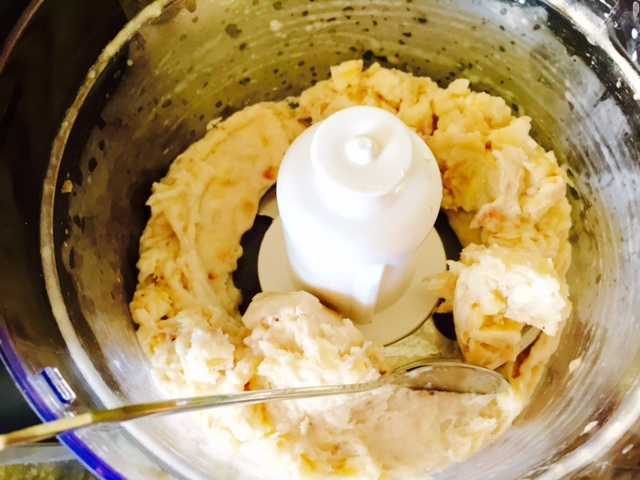 I have another recipe for a much easier no churn ice cream, which I hope to try next week after all the Harbor Festival fun this weekend in Bristol. I do think this is a good recipe, but perhaps it is more suited for those who have an ice cream machine. Stay dry out there, thanks for reading and Happy Eating! That is, when your ice cream thaws out…. UPDATE: So, I let the ice cream thaw out and it was great! The flavor reminds me of autumn, so will make this again in a few months for sure. I think a nice caramel apple sauce on top would compliment it well. Happy Thursday and hope summer is treating you all well. Another sunny day in Bristol, but not too hot. Its the kind of day you can spend hours just sitting in the sun, watching the boats on the harbor side. Although alot of people seem to be exploring the city, trying to find all the Shaun the Sheep statues which are on display until the end of August. For me, I spent some time along the river Avon. After a run along the river, I decided to open another one of the cheeses I bought at the Royal Three Counties show. 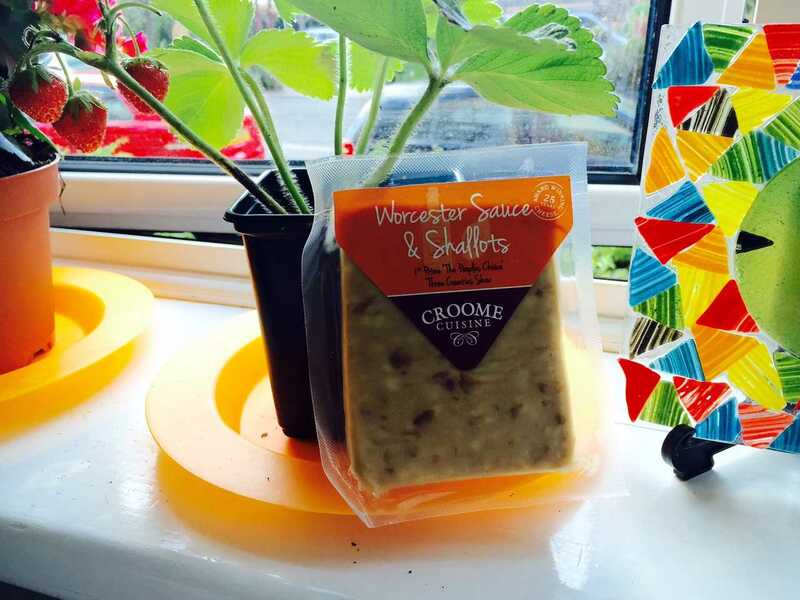 This time, I decided to try a mature cheddar with Worcester sauce and shallots, made by Croome Cuisine in Worcester (Church Lane, Whittington, WR5 2RQ). I’m not sure if they have an online site, but they seem to be quite active on their facebook page where they list some of the different shows and shops where their products are available. But first a little foodie history. 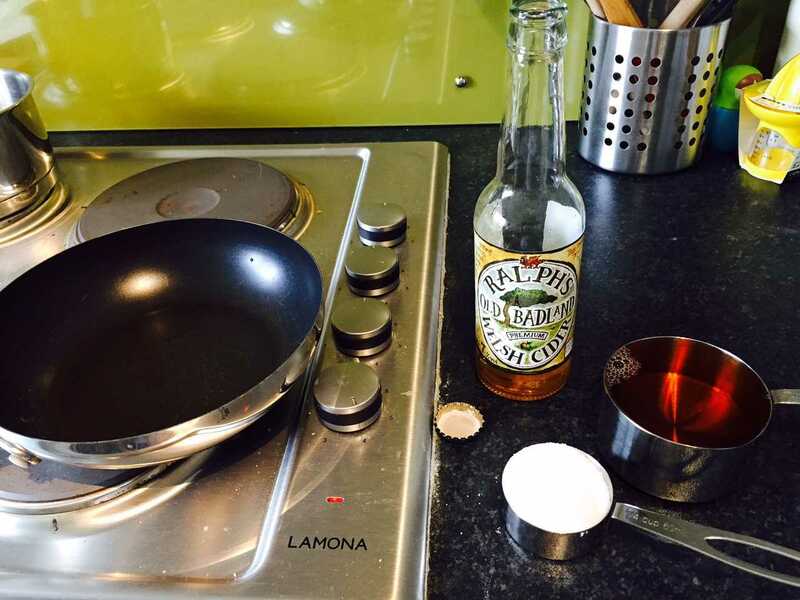 So, back home we use Worcester sauce in a lot of different foods, and most of us are probably pronouncing it the wrong way. Except those in Boston; they actually pronounce words like Worcester and Gloucester properly. Anyway, back to the sauce. My main reason for choosing this flavor was because the cheese was made in Worcester and also contains the sauce of the same name. But what is it exactly? I don’t know about you, but I tend to use Worcester sauce when making beef dishes. It just compliments the meat in such a savory way, and when slow cooked, creates such a robust flavor throughout. Did you know it is actually a fermented sauce? The main ingredients tend to be barley malt vinegar, spirit vinegar, molasses, sugar, salt, anchovies, tamarind extract, onions, and garlic, according to the Wikipedia page (although a lot of brands may use slight variations of this). Yeah, not what I was expecting either. Nonetheless, the result is a wonderful, multi use condiment. The sauce was popularized by Lea & Perrins in the 1800s, who still dominate the market today. Apparently, what they originally made was so strong, that it was abandoned in a basement. A few years later, they retrieved it with the intention to start again, and to their surprise, the sauce had fermented into a condiment with a much smoother taste. I really wish I can make that kind of mistake in my kitchen! 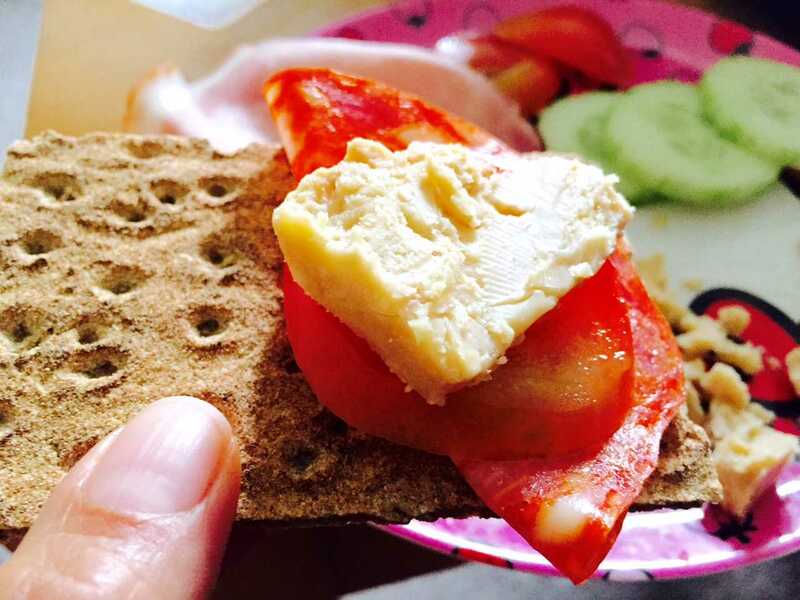 Anyway, this cheese made by Croome Cuisine is a mature cheddar with a strong taste. The shallots are steeped in Worcester sauce (although I couldn’t find how long for) and then added. This makes for a very robust flavor and you only need a little to make your mouth happy. It is soft and crumbly, with a very light brown color. As soon as you taste it, the Worcester sauce hits your taste buds in the same way it would if you were eating the sauce with a nice steak. This paired well with tomatoes, cucumbers, and some deli meats atop rye crackers. I would definitely buy this again as its such a unique product that represents one of England’s most famous condiments. I don’t think I would use this cheese in cooking or adding to a separate recipe, because I wouldn’t want anything to mask that flavor. Well, actually, if I had a steak covered with a nice mushroom gravy, this cheese would be perfect if sprinkled on top. Otherwise, I would just enjoy it on some crackers while watching the world go by. I’ll hopefully get around to a few more cider recipes soon. I have something sweet in mind that I’ve been looking forward to trying out. Until then, thanks for reading and Happy Eating! What a beautiful day in Bristol! And a great day for a bit of low key 4th of July grilling. 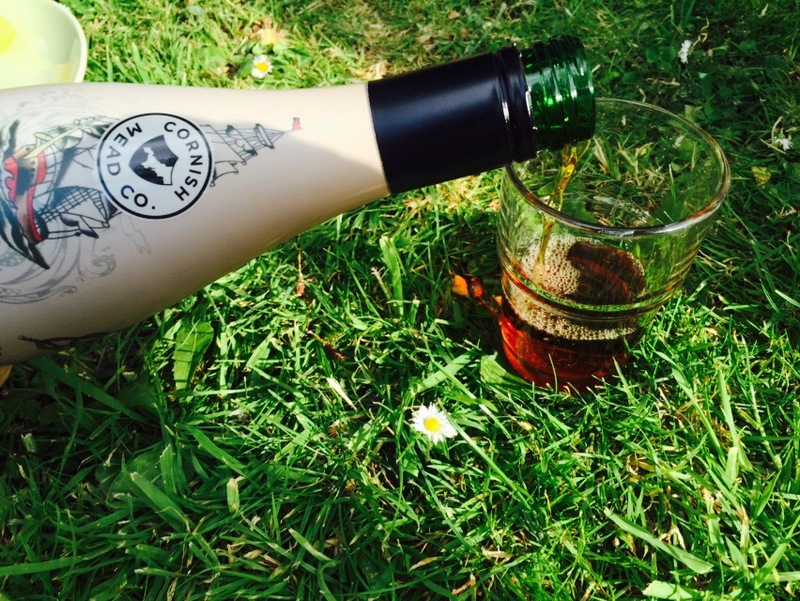 We decided to crack open the mead we bought in Cornwall from The Cornish Mead Company. This was very sweet and refreshing. I think it would be great over ice, as part of a cocktail, or mixed with soda water. This batch had a dark golden color and hints of subtle grape undertones. 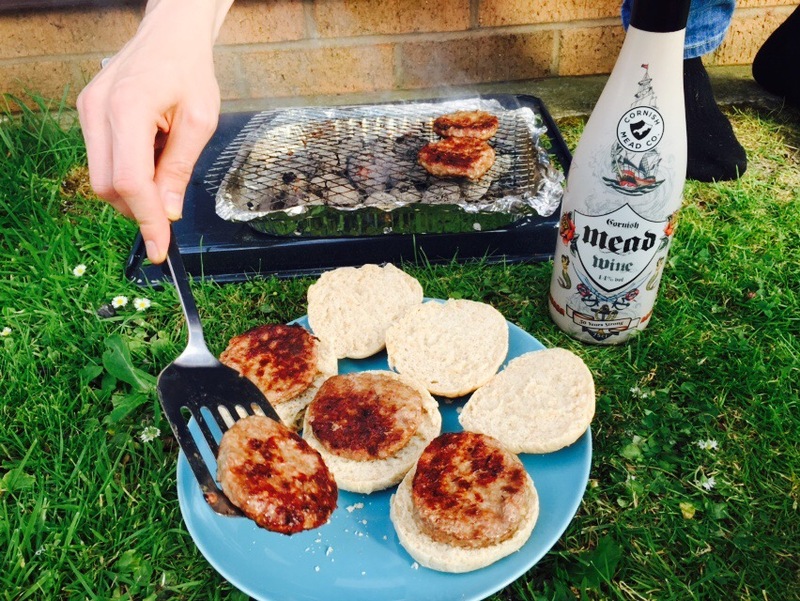 And at 14%, this was a GREAT addition to our little BBQ. 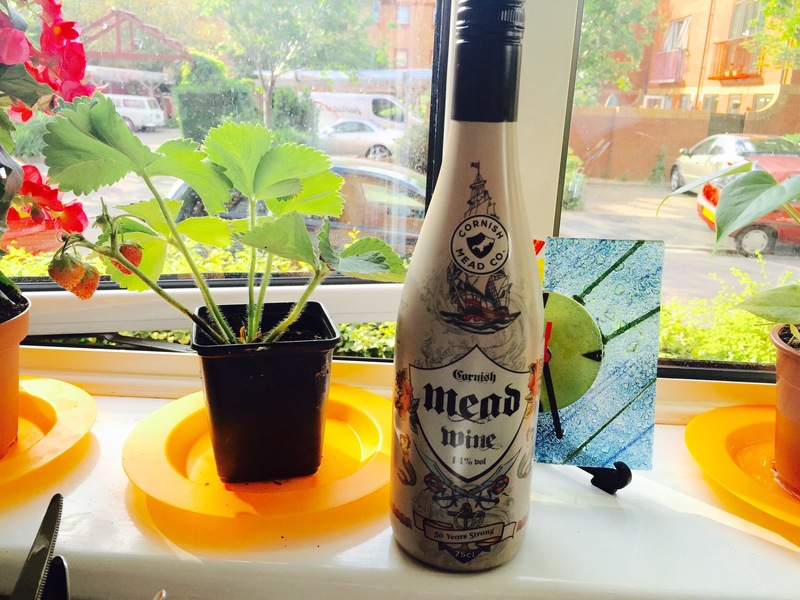 The Cornish Mead Company has been producing wine for over 50 years, so I’m really looking forward to trying other flavours. Hope you’re enjoying your day wherever you are. And to England, I’ve got nothing but love for ya! No hard feelings, yeah? 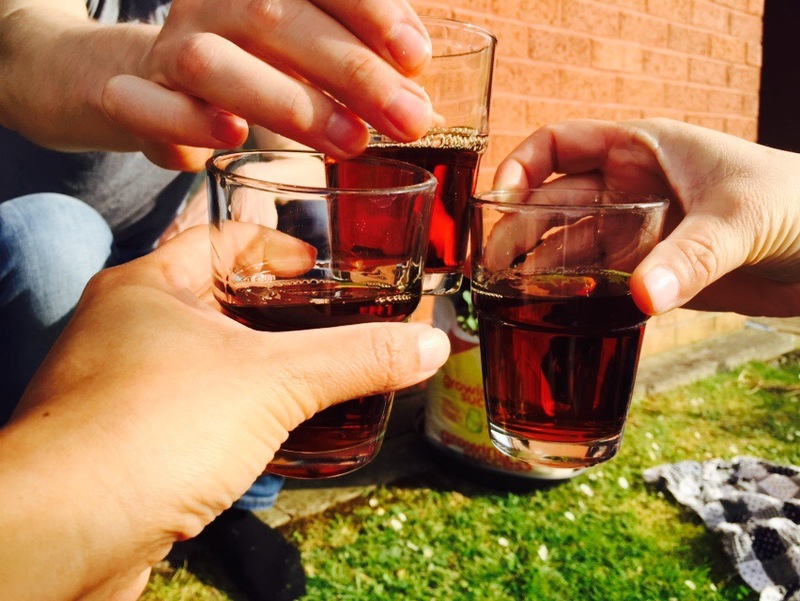 So today, cheers to America and cheers to Bristol for taking me in. Thanks for reading and Happy Eating! Happy Summer! Looks like it is here to stay for a month or two. While its scorching in London, the Bristol weather here is warm with nice, cool breezes. 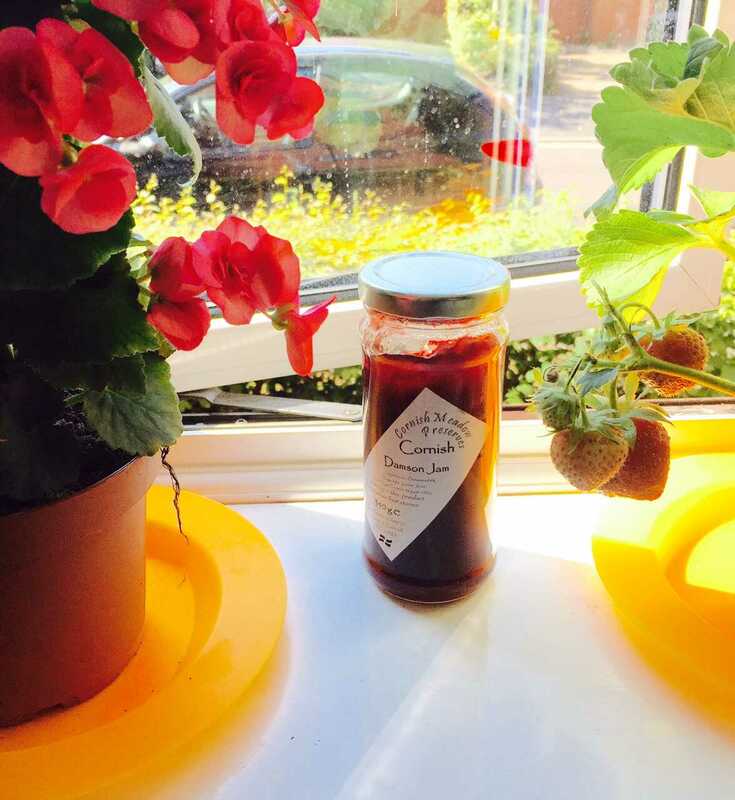 So, I thought it was a good time to utilize some jam I picked up in Newquay, Cornwall. 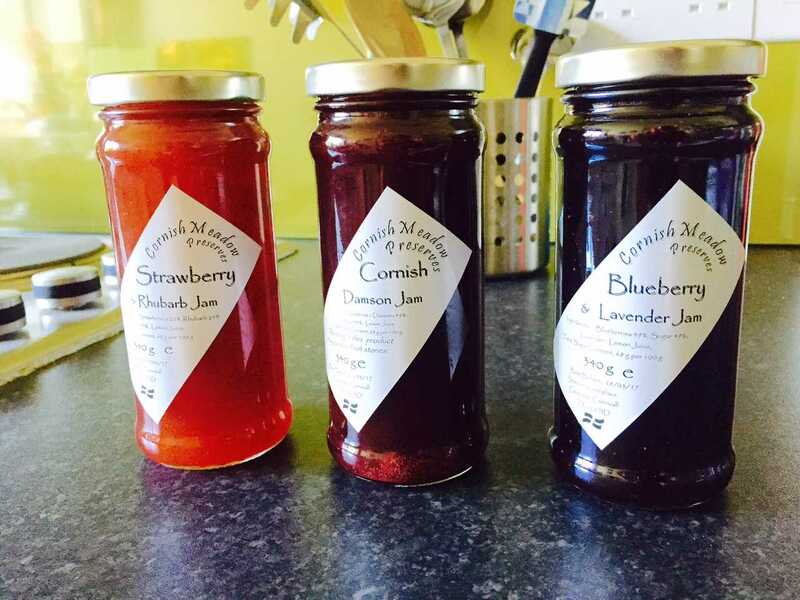 These lovely preserves are made in small batches by Cornish Meadow. I chose Strawberry & Rhubarb, Blueberry & Lavender, and Damson. They also make a plethora of other flavors and mustards with online ordering options. 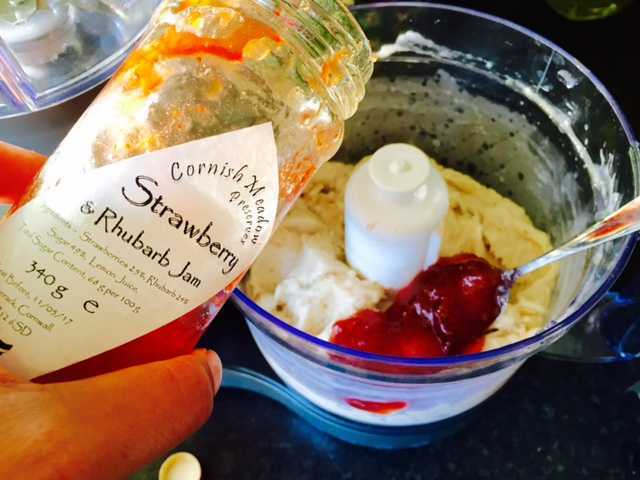 You can find these products at many shops in Cornwall and also at local food shows and markets. I bought mine at The Cornish Fudge Shoppe located at 45 Fore Street in Newquay. 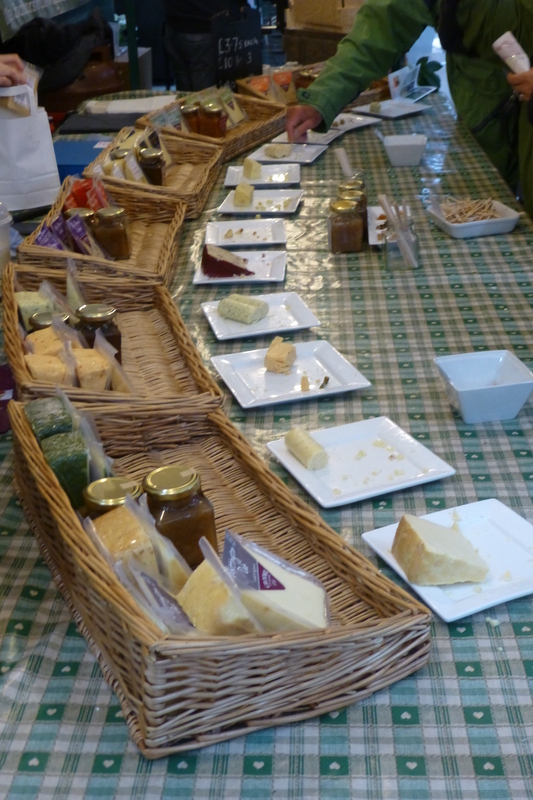 They had lots of Cornish Meadow Preserves flavors available as well as marmalade and homemade treats. I decided to use the Damson jam for today’s treats as I have never heard of the flavor before. Damson is a type of plum variety found in mainland Europe and Great Britain. 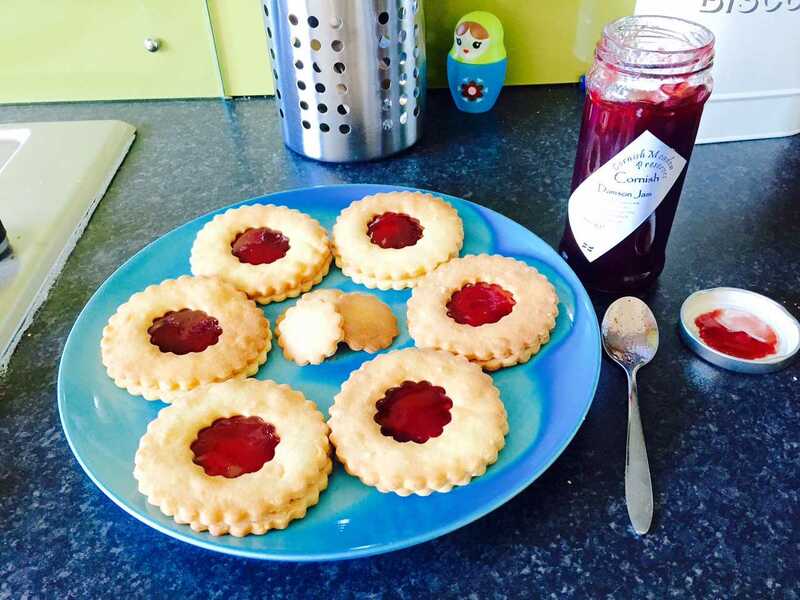 The jam itself is sweet, but not sour, so it will work perfectly for what I have baking today. 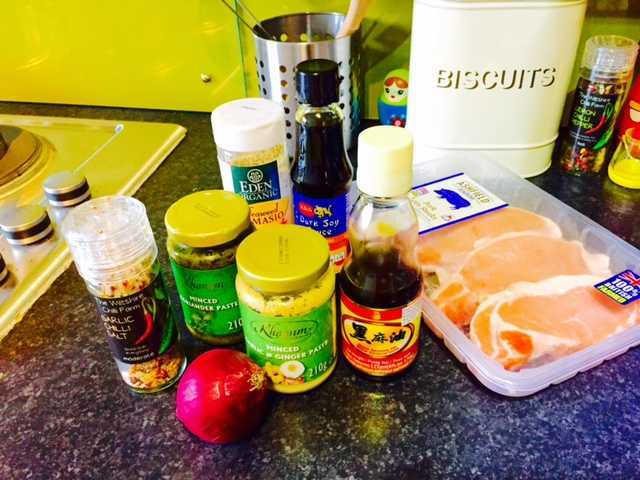 Just a few ingredients for this tasty treat! In my haste, I almost forgot to take photos of the mixing process. But you didn’t miss much. First I creamed the butter, powdered sugar, and vanilla. It helps to leave the butter out a bit to soften if you don’t have a mixer. Once creamed, add the flour bit by bit. I added a half a cup of flour at a time until it formed a dough, then continued mixing and kneading with my hands until it was nice and smooth. 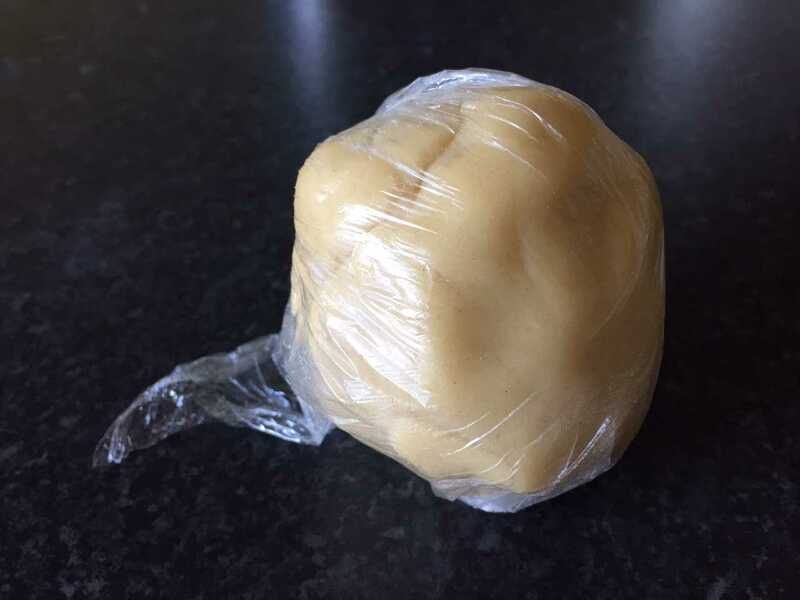 Because the butter softens easily, you’ll want to wrap the dough in plastic wrap and let it sit in the fridge for an hour before rolling out. 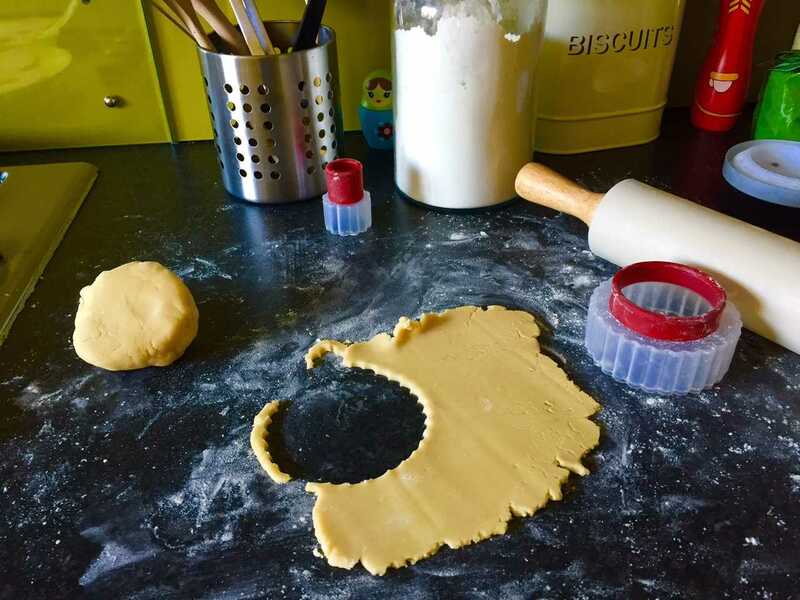 Once the dough is chilled, turn it out onto a floured surface. 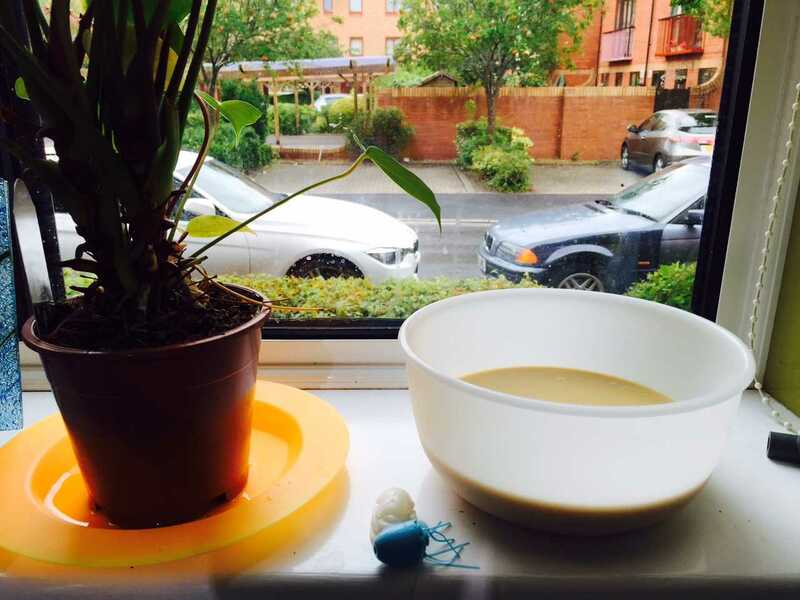 Because it has been warm in Bristol, it didn’t take very long for the dough to be malleable. Before you start, make sure to set the oven at 180 C, or 350 F and line a baking sheet with paper. Roll out the dough with a rolling pin to about 1/3 of an inch. In actuality, you can make it as thick or thin as you like it, but too thin may make it difficult to transfer to the baking sheet. 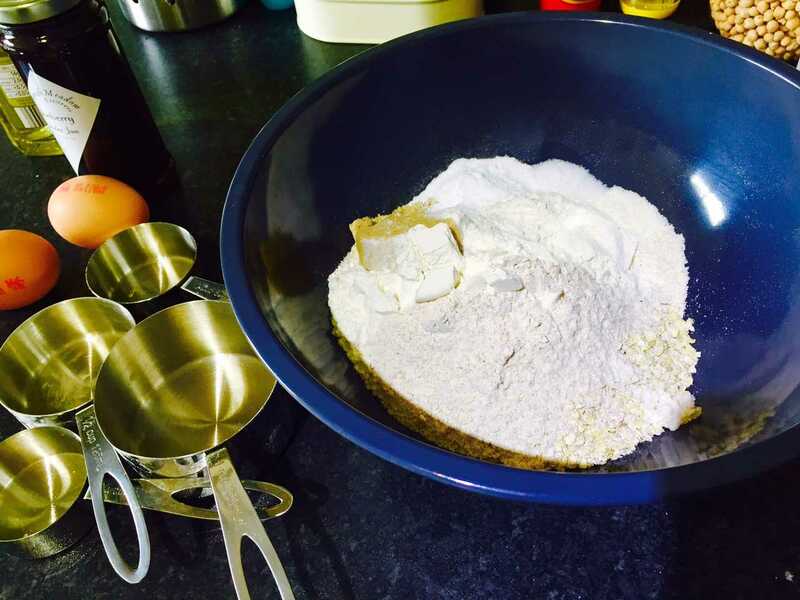 Make sure you put enough flour on the surface, as too little flour will cause the dough to stick to the surface when you roll it out. Also, a side note. If you don’t have a rolling pin, you can also use the side of a wine bottle to roll out the dough. I tried this method when making my galette a few weeks ago and I had a great result. 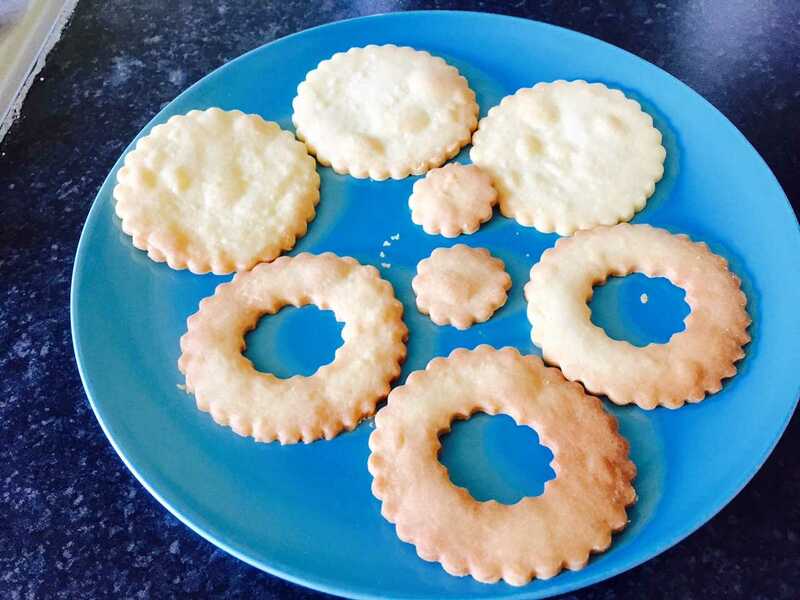 Once rolled, cut out an even number of cookies with a large cutter. 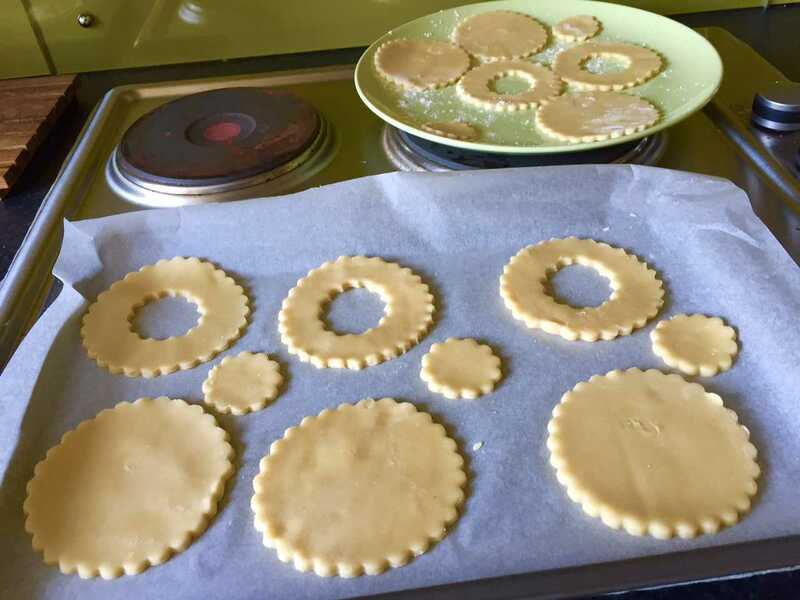 In half of them, cut an additional hole in the center and place on a lined baking sheet. If your kitchen is warm right now like mine was, place the rest of the dough or cut out cookies in the fridge until its time for the second round to be baked. You will bake these for 10 – 15 minutes; you want them to be brown on the bottom, but still light in color overall, so keep an eye on them. I have a fan oven, so I left them in for 12 minutes which was sufficient. Once out of the oven, transfer to a plate or rack to cool, but only a bit. I like to spread the jam on them while they are still a little warm. 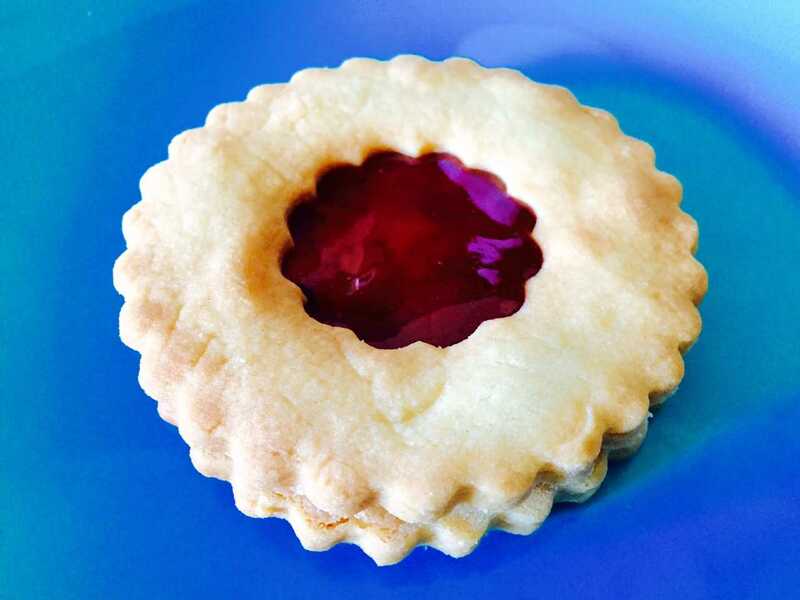 Simply spoon a dollop (about a teaspoon) of jam onto the center of the full cookie, spread it out a bit, and place the holed cookie on top, and that’s it! 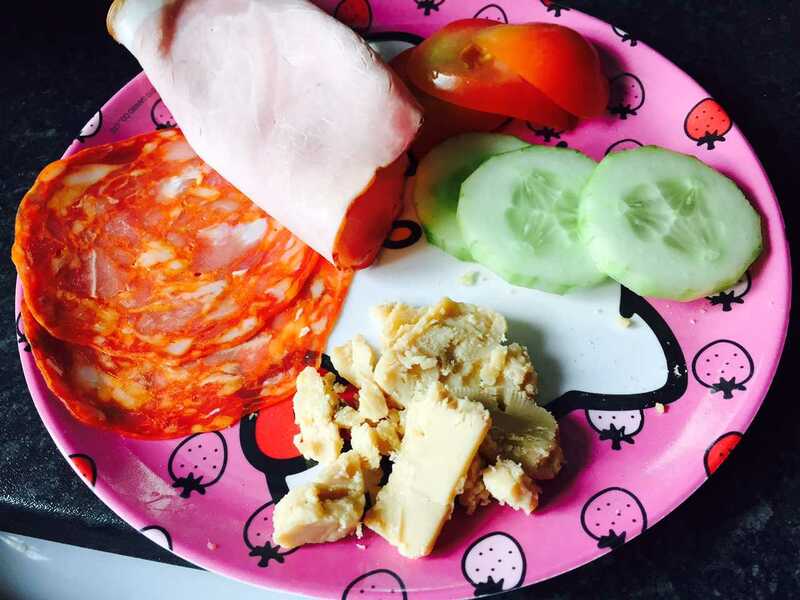 So easy to prepare, this step is a fun activity for younger kids too! And there you have it! 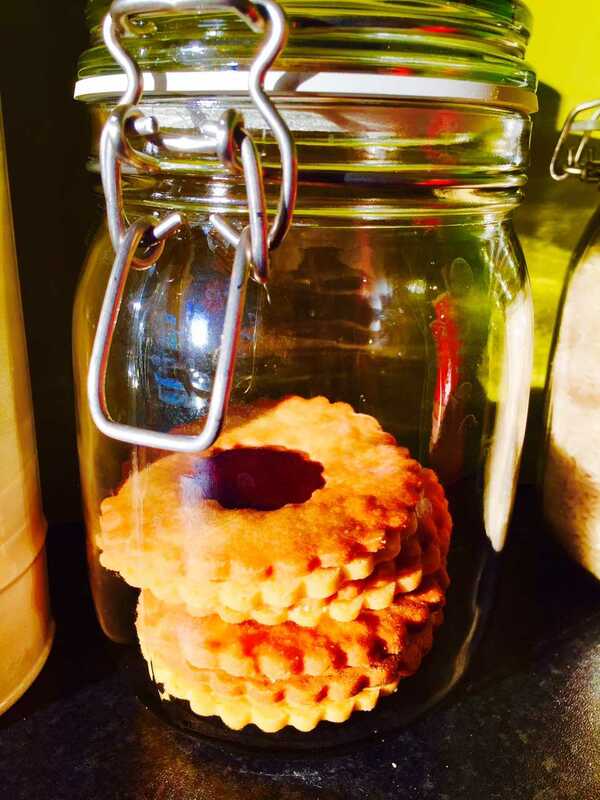 A traditional English Jammie Dodger with Cornish Damson jam. This recipe is so easy to prepare with ingredients most people probably already have in their pantries. 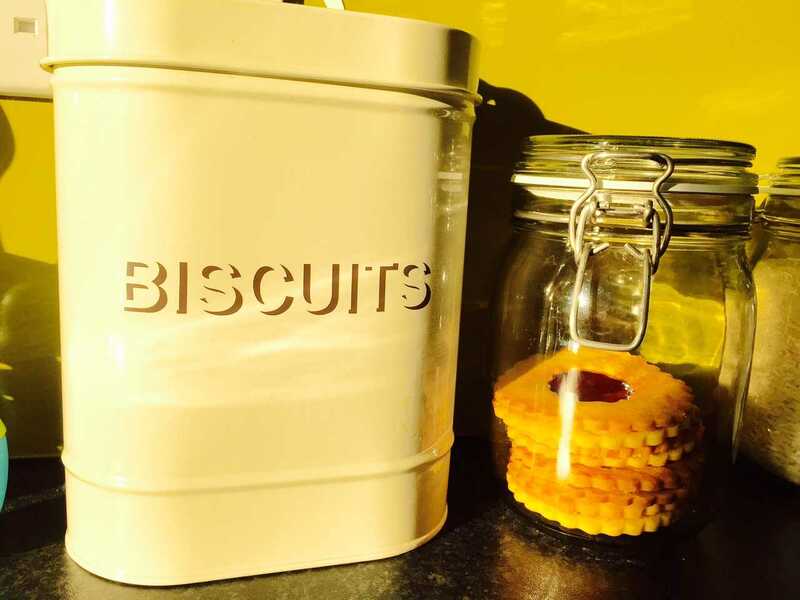 Its a perfect addition to garden parties, summer picnics, or your own biscuit tin. My cookies turned out tasty, but very sweet. I think if using powdered sugar in the future, I will try to reduce it to 1/3 or 1/4 cup. As powdered sugar is very fine, a little goes a long way. I really enjoyed making these, especially since they are one of my husband’s favorite biscuits. Next summer, I hope to attempt to grow my own berries so I can make some jam for summer time treats. With such a simple recipe, there are tons of variations you can create by adding to either the dough or by creating a new type of filling. It’s getting hot here in England, but where ever you are, stay cool. A cold cider usually does the trick! Thanks for reading and Happy Eating!